When Did I Start Gardening? When did you start doing something? When did it move from something you do to a hobby, and then to a passion? I’ve always drawn: that is my in-born talent and passion. I didn’t “start” doing it, move on to hobby, and then to passion. Drawing, painting, creating – that’s just who I am. But gardening. 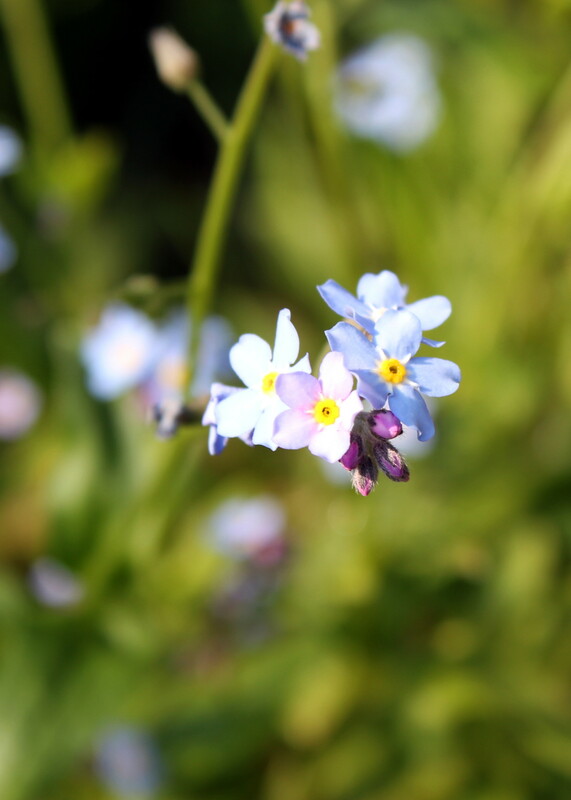 My fascination with wildflowers. That’s different. My only recollection of a vegetable garden was Child Labor. My parent’s preferred form of punishment for infractions was to ground us kids to two weeks of having to stay home and weed: the garden, the yard, the space between sidewalk and street curb. In the ninety-degree Nevada sun. No weed was to be left standing, not even the pernicious salt grass. We had hoes and bare hands. I remember a hike somewhere off of the Columbia Gorge. 1972. I was just entering Snarky Teenage Girl stage. I felt awkward in my changing body. We were traveling to some Soil Services Convention (does that sound remotely exciting to you?) 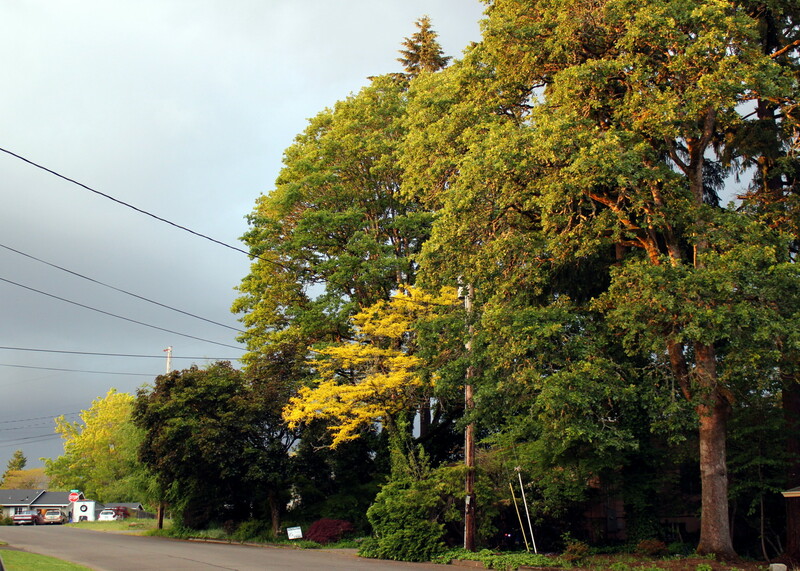 in Portland, Oregon. The highlight of the trip was that my father purchased tickets to see the Royal Lipizzaner Horses at Memorial Coliseum. It was in the nosebleed section, but – horses! Because I knew my dad didn’t share my obsession and this was special for my sister and I. We stopped somewhere along the Columbia River Gorge and hiked out some nature trail. I have no recollection of where it was, only that it was some managed site. I walked through with my father, who patiently pointed out plants to me. He knew both the Latin and common names. At the end, he quizzed me, and I failed. Miserably failed. I saw the disappointment in his eyes, but I was too snarky to care. (Years later, I wrote to him and apologized “for the year I was 15”. He came back with, “I thought it was me.” No, Dad. It was me being 15 years old. I moved out at the age of 17. Wanderlust had a grip on my heart. My first garden was a little border of annuals I planted beside a rental I lived in for a year. I then moved into a rambling 1920’s square house with two girlfriends. 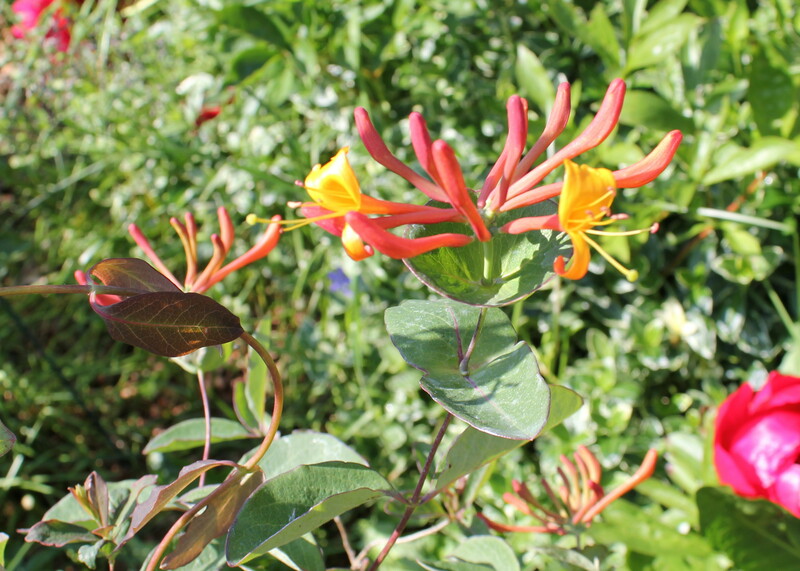 It had wild honeysuckle, Bishops’ weed, and red peonies growing wild in the front yard. 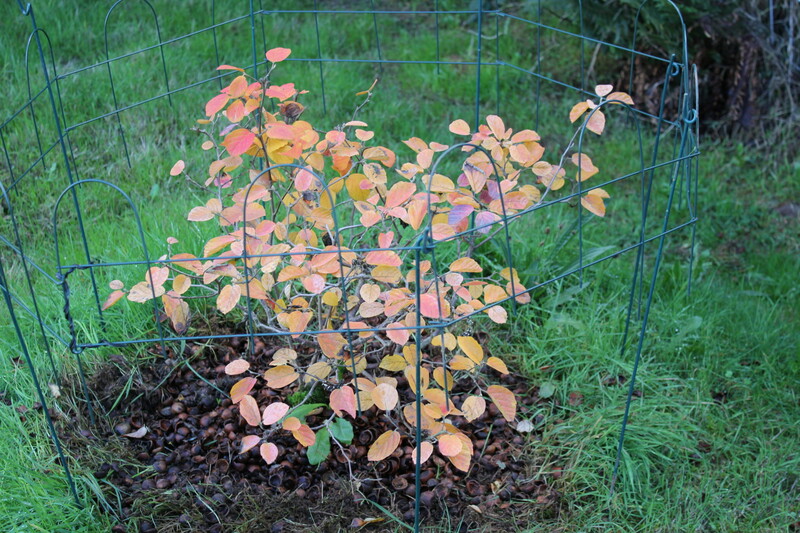 There was a tangled mess of a tamarisk bush. 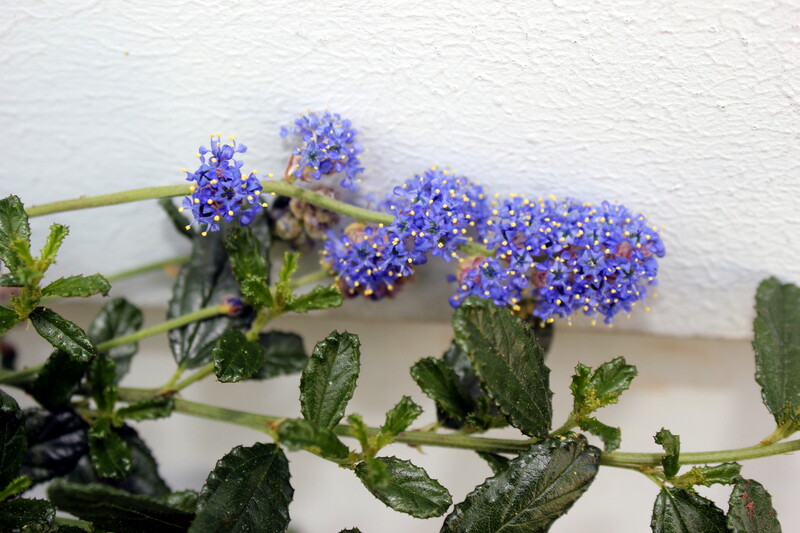 I didn’t know anything about invasive species, so I babied that plant and pruned it up pretty. My husband and I later lived in the same house. Donald loved to grow vegetables. Fortunately, he also liked to weed. 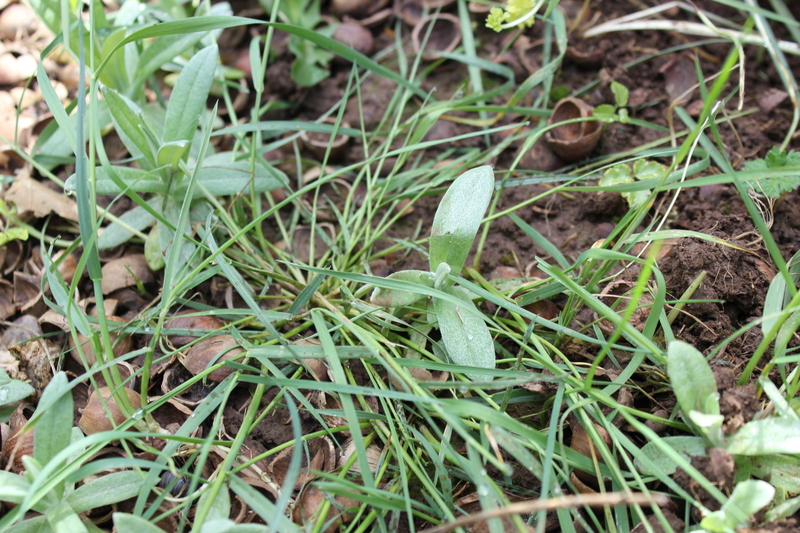 I did some of it, slowly learning the names of pernicious weeds – many of which are also herbs – like Shepherd’s Purse and chickweed. I started canning: jelly, jam, apricots. We moved to the lower Willamette Valley (Portland metro area) in 1983. We rented a house on an acre in an unincorporated part of Clackamas county and started raising chickens. the yard was a disaster of unkept flower beds. Roses were being swallowed up by grass. I was pregnant and unemployed and I hardly knew anyone, so I started working in the yard. Weeding. The slugs were the worst. Huge slugs. Slugs of all sizes. Gluttonous slugs. I filled a bucket with bleach water and dropped them into it. I didn’t look and I dumped the mess somewhere behind the garage without looking. You can kill easily without looking. Salt took more time. There seemed to be no end of slugs. The only thing I took away from that garden was the Dragon lily – and quite literally. 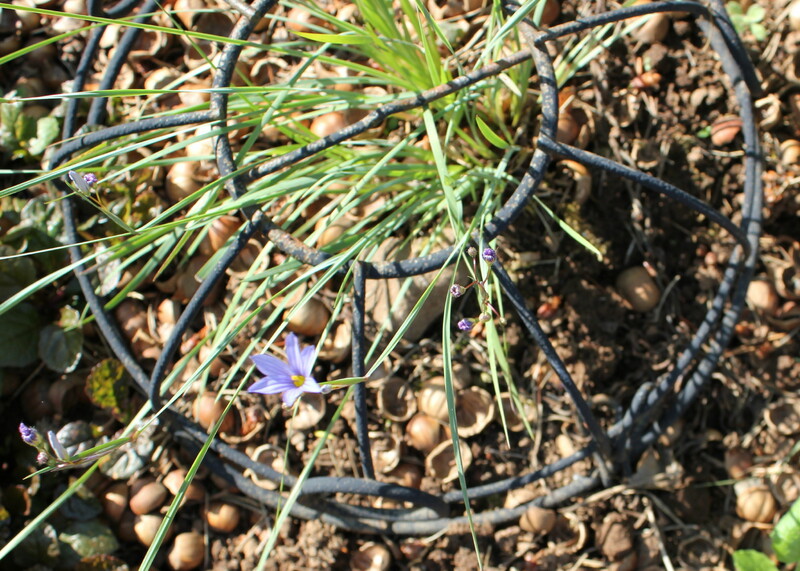 We dug up all the bulbs without asking or telling, filled in the hole, and moved to our first real home. That was a Cape Cod bungalow down by the river. The yard was – again – a disaster. 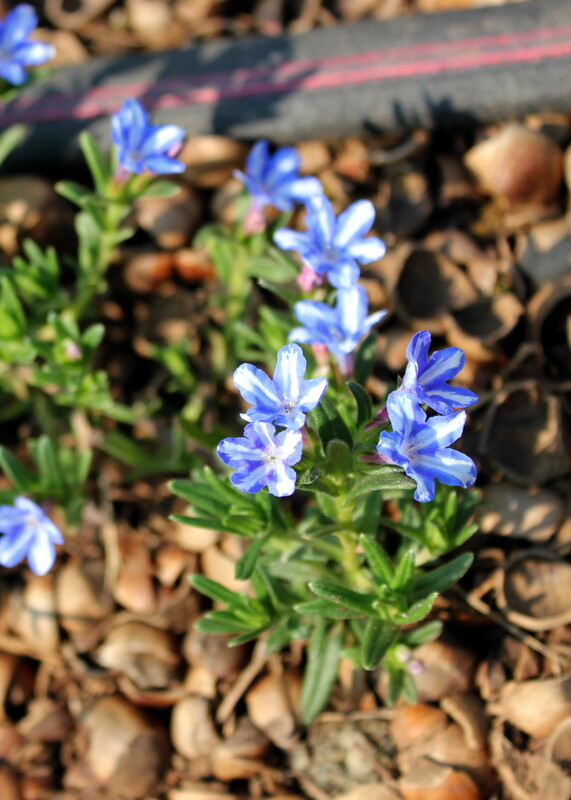 The periwinkle/creeping myrtle had been allowed to overgrow the tiered flower beds. 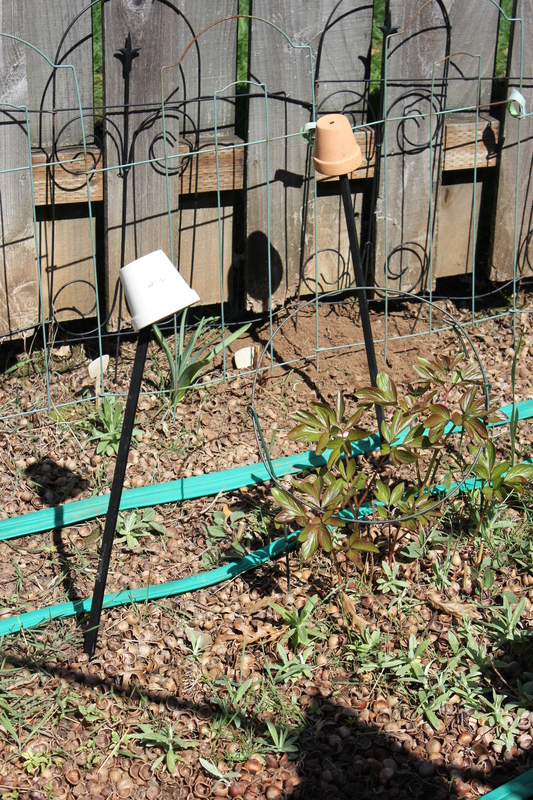 We planted roses and columbines. We lived there for almost five years and I cleared every inch of the flower garden, encouraging flowers every inch of the way. Then bad things happened financially, and we lost the house. Well, we managed to sell it, but we only broke even. It was the beginning of a long, dark, tunnel of financial issues. Eventually, we moved into a single-wide trailer (I refuse to call it a manufactured home – it was a trailer). This trailer had a small front yard and a large back yard. Technically, the back yard was “our” yard and the front yard belonged to the trailer in front of us. Fortunately, our neighbors uphill wanted the flat area behind us for their yard (so they could put up a basketball hoop) and the neighbors on the other side didn’t care, either way. We took over the shady portion outside our front door. I took that area from nothing to a sculpted lawn (shaped somewhat like a fish) with flowers, wild ferns, raspberries, roses, and even a row of vegetables in the sunniest portion. 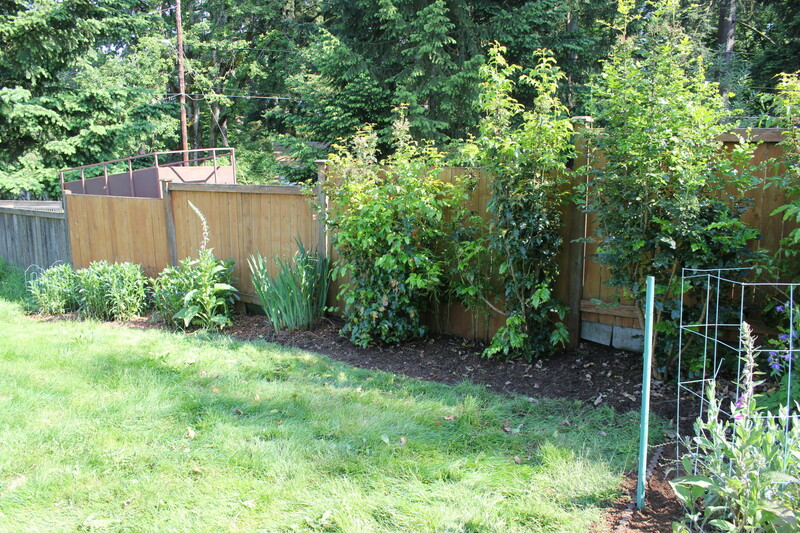 Every bit of landscaping was created by my hands with the exception of the espalier apple tree that my husband planted. I even prayed down the deformed pine tree in the front yard. Seriously. We got eleven inches of snow one day and I looked out at that hated pine tree and prayed, “Lord, just let the snow kill it.” It fell over within the day. Thank the good Lord above! A friend pulled out the stump. 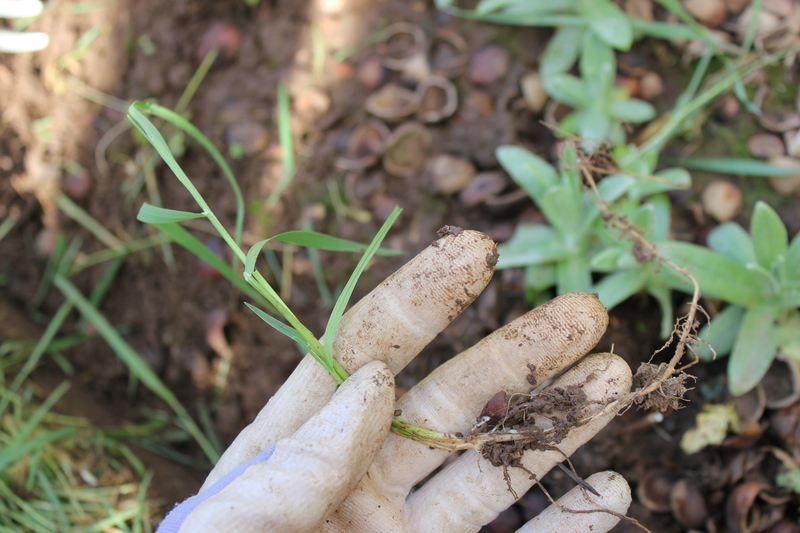 I discovered that I loved to get out there and pull weeds, deadhead flowers, and baby green growing things. Except when my neighbor was the Bible-quoting superwoman of ministry. This woman could quote the Bible. We attended the same church and she was really a nice enough person, but really? I’d be on my knees, silently praying, and totally enjoying the sound of birds, the smell of earth, and the feel of sun on my back. She’d open her window and lean out. But I am nice and I let the poor 13 year old skater boy suffer. I did offer him some suggestions on the side, but all I saw in his eyes was the hurt from being the child of the first “mistake” marriage and the perfection of his younger sibling. Dammitall. They moved long before we moved, but I think of that boy often, and I hope he still gardens – despite his Bible-quoting mother. We were financially stable by 2001. Bad debts were getting paid off rapidly and our credit score was finally in the mid-600’s. We could get a home loan. It was low, and the market was a Seller’s market, so it was – technically – a bad time to buy. But, we had faith that this was our time. And it was. We found this cute little Cape Cod bungalow with an awesome bathroom (large claw foot bathtub separate from the shower) and hardwoods throughout. Selling point? 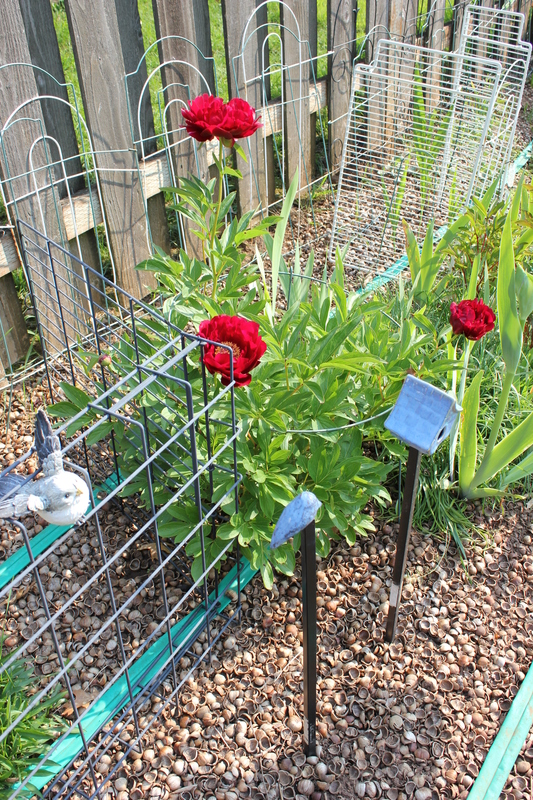 That would be the peonies. They were well past blooming, but I recognized the foliage. 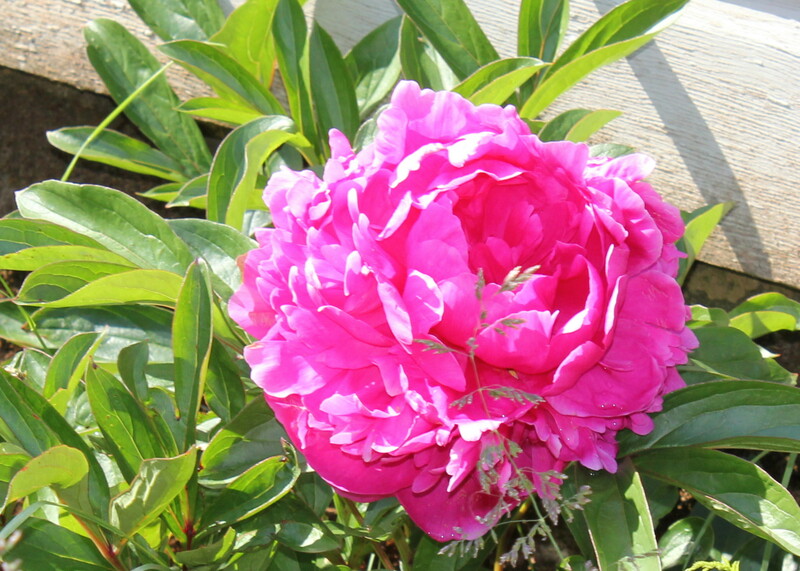 There were a lot of peonies in this yard. 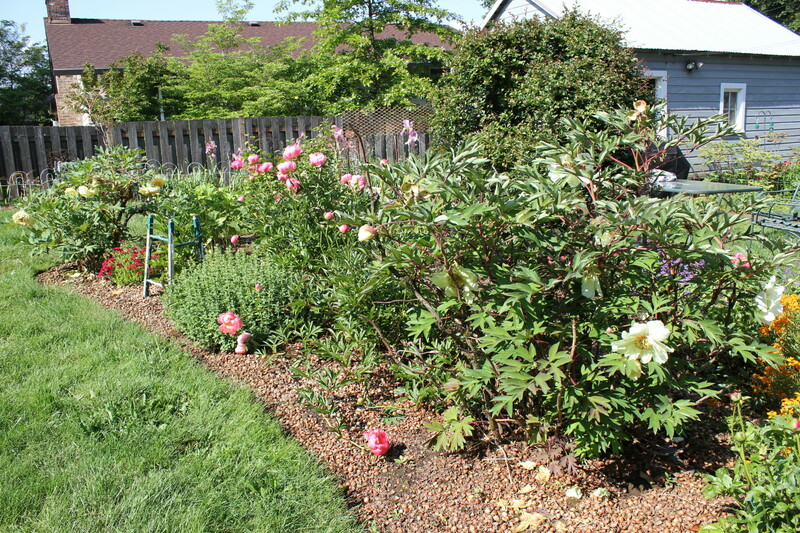 The yard was swallowed up by invasive grass and would need a LOT of work, but – peonies. LOTS of peonies. 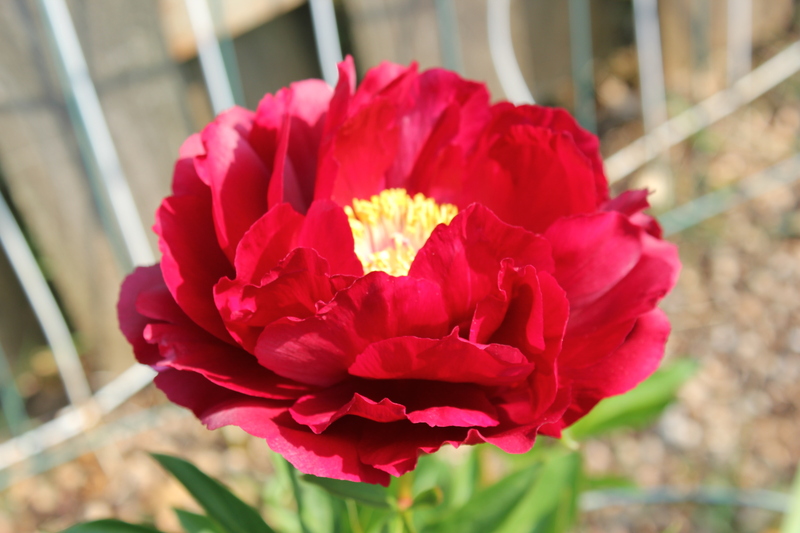 The seller requested that we allow them to dig up some of the red peonies. What the heck? 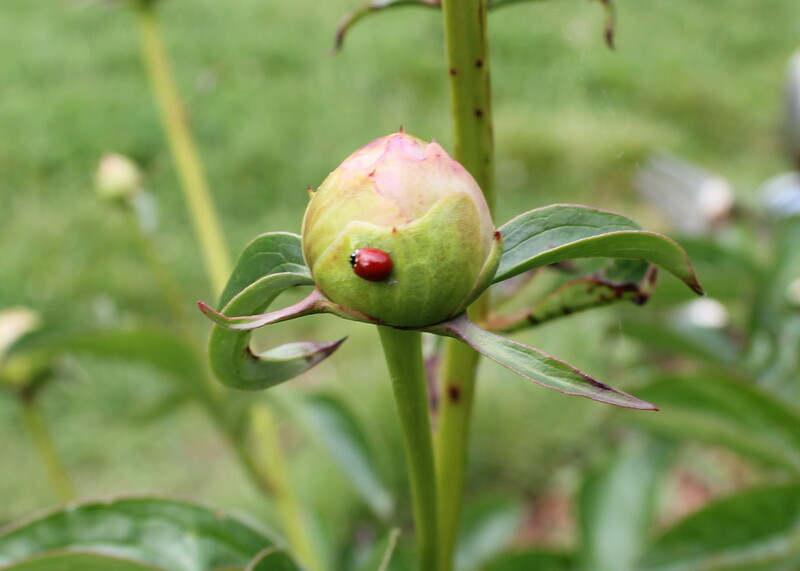 That was an easy request and we let them take some of their favorite peonies. They took the ones that are my least favorites – they didn’t touch the tree peonies or the triple reds or the double salmon ones. And they didn’t take enough of the red ones to hurt that part of the garden. They could have taken more. My Sunday plans to meet up with friends fell through, but it could not have happened on a nicer Palm Sunday. I quickly changed gears and got ready to muck it out in the yard. I had grass to deal with. We have a lovely lawn out front, with real lawn grass (and a lot of moss, but, hey – we live where we live). The back yard, however, is a mess. 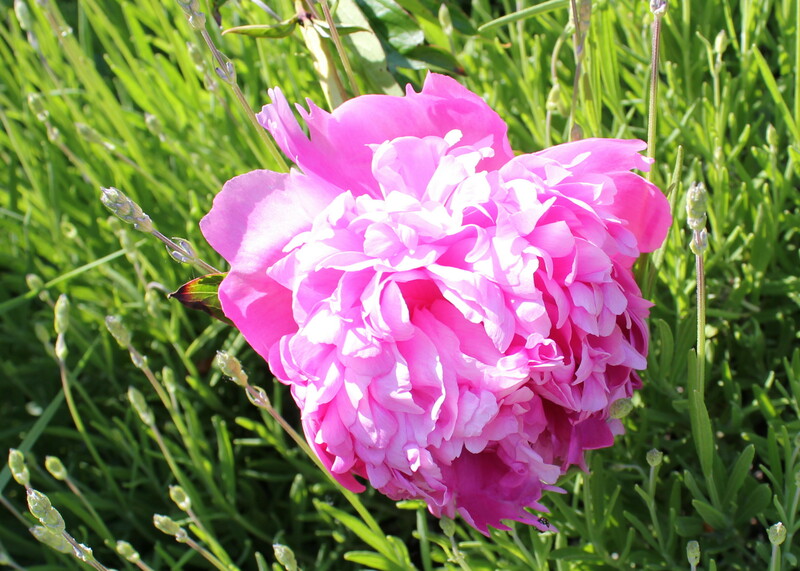 I don’t know who to blame for this: Barney Schultz, who bought this house in the 1930’s and turned the yard into a peony meadow, but then got old and couldn’t take care of it? Or the people who purchased it from the estate with the intent of “flipping” it, and so concentrated solely on the interior remodel and not so much on the garden? 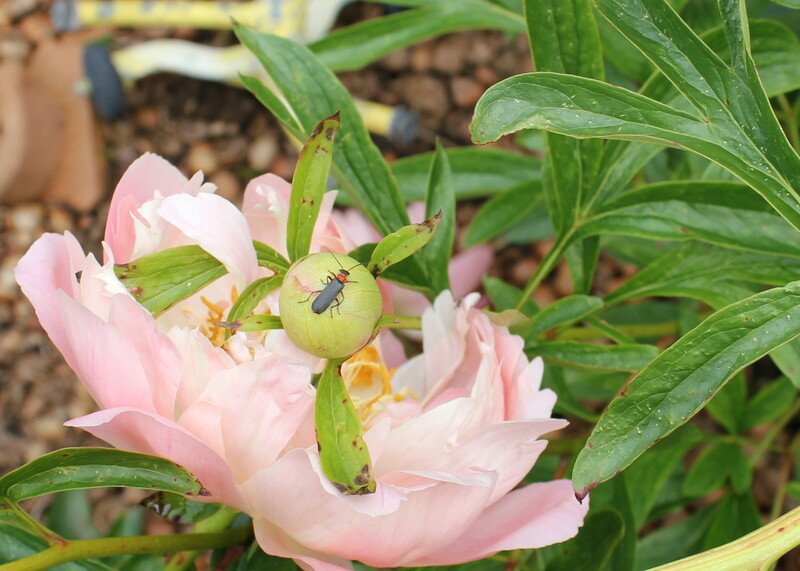 The latter asked us if they could remove some of the peonies when they moved, and we gladly obliged because I knew that removing some peonies would not affect the overall peony garden (peonies, like irises, need to be divided every few years. And no matter if you *think* you got them all, you didn’t). EVERYTHING in the yard then was overgrown in grass. 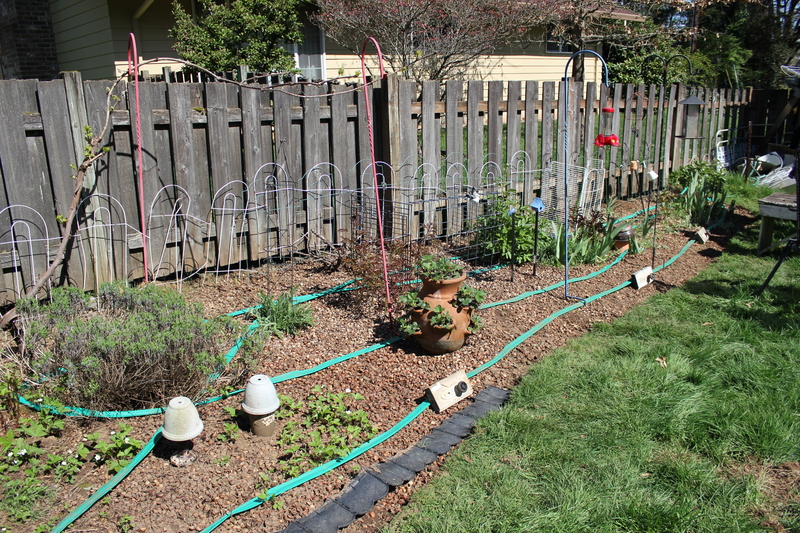 I dug up sod, peeled back grass, and hand-created the flower beds we currently have. This is not ordinary lawn grass. 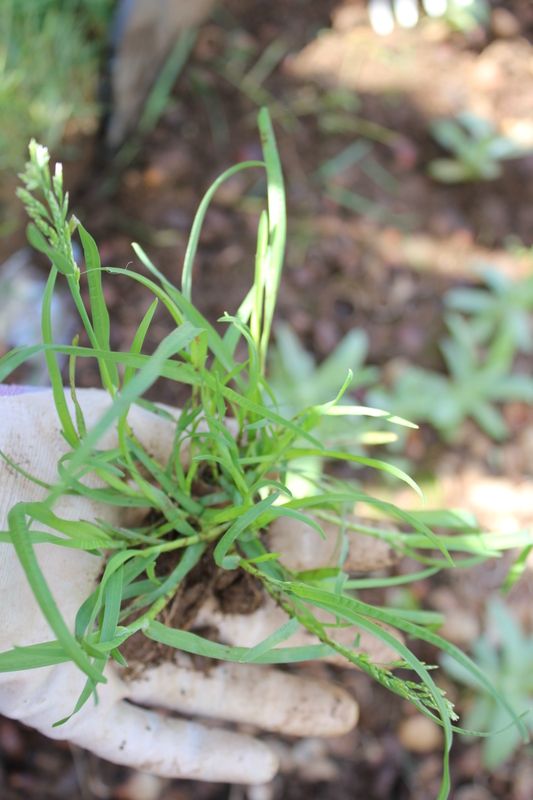 We have crabgrass, clumping grass, running grass, and several other horrid invasive grasses to contend with in the back yard. 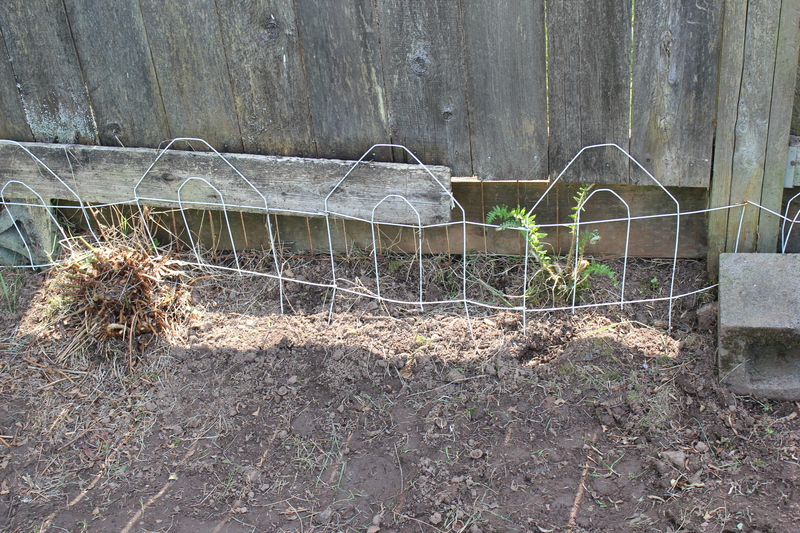 The only reason(s) we don’t raze the whole thing is: my flower beds and the dogs. The dogs dig potholes in the “grass”. If it was lawn, I’d have conniptions. It’s not, and when I edge garden beds or dig out new garden beds, I use the sod to fill in the holes. Works for me, for now. I want to get the grass out of my flower beds, but it’s damn near impossible. Yes. I just swore. The clumping grass comes up pretty easily right now. Yeah, that stuff. 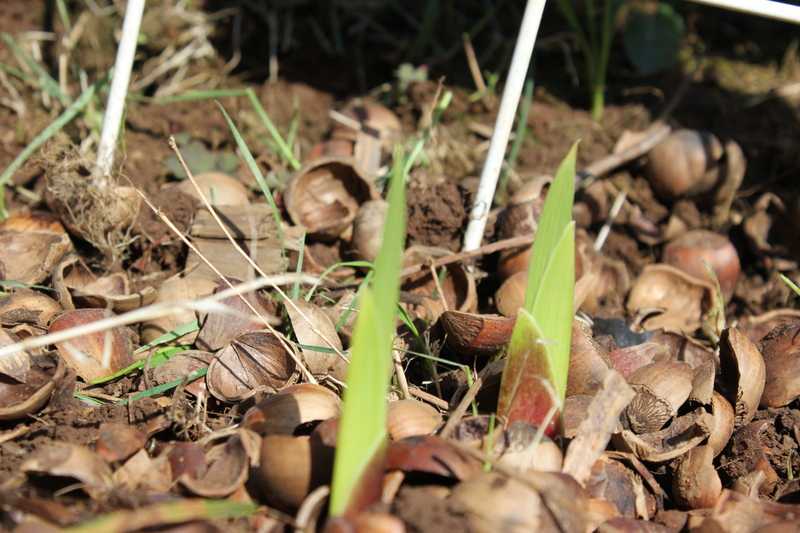 It’s not tall enough, the ground is too muddy, it’s too wrapped up around the iris tubers… Just.Ugh. Still & all, I made a really good sweep along the north end of the yard. I only left the grass in the iris beds, which I will just have to figure out some other time. My main goal was to pick up the oak leaves and pull up the grass and weeds that I could get to. And looky here! Gladiolas pushing upward! 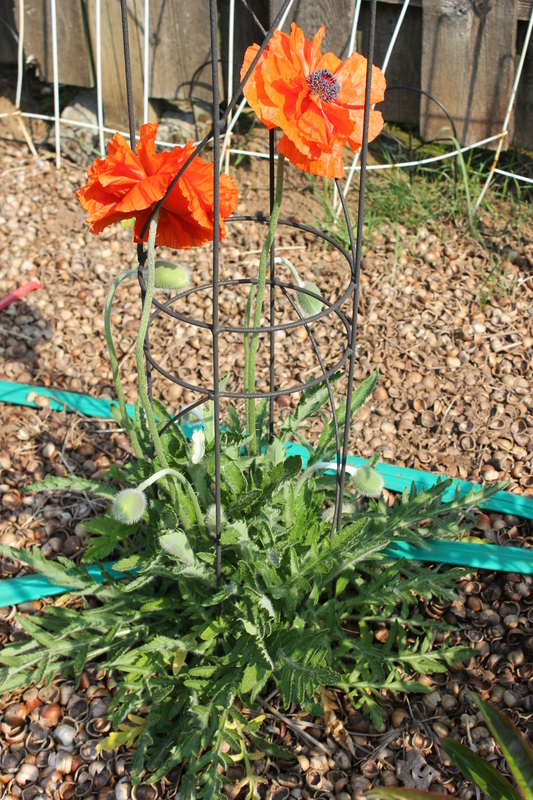 Oriental poppies getting ready to bloom! 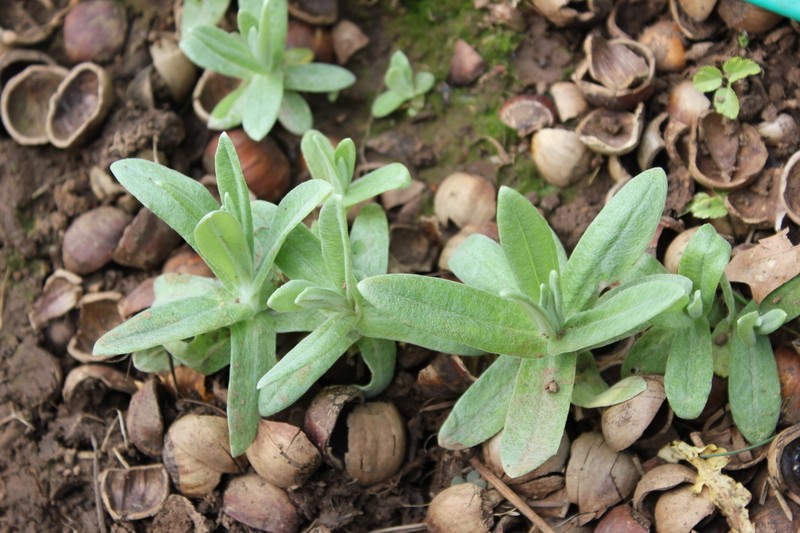 Pearly Everlasting pushing up through the hazelnut mulch. This happens when you realize you have runaway crocosmia that need extra protection from 80+pound dogs. 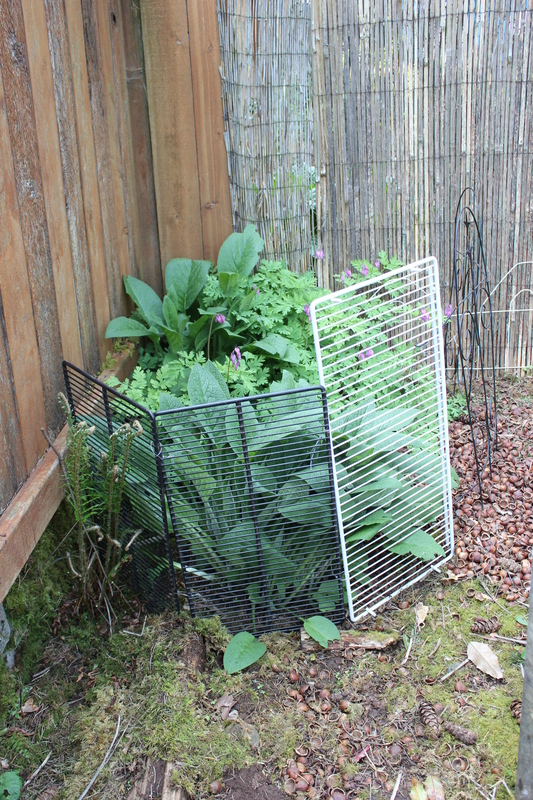 I use whatever is available (in this case, old wire shelving) to form a fence around my precious plants. 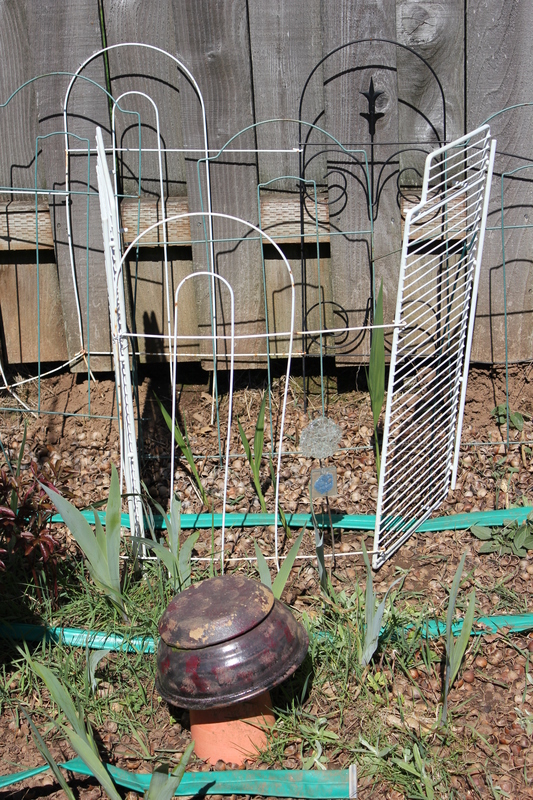 The mushroom planter in the foreground doubles as a place to hide slug bait where big dogs and birds can’t get to it – but slugs can. I have a method to my madness. 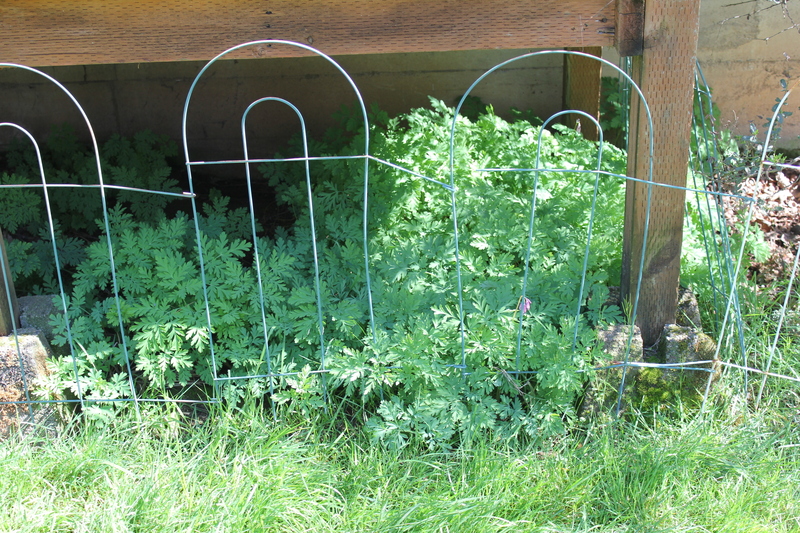 Random stakes in random places also deter large dogs from deciding to lay down in flower beds – or make a habit of trotting through. 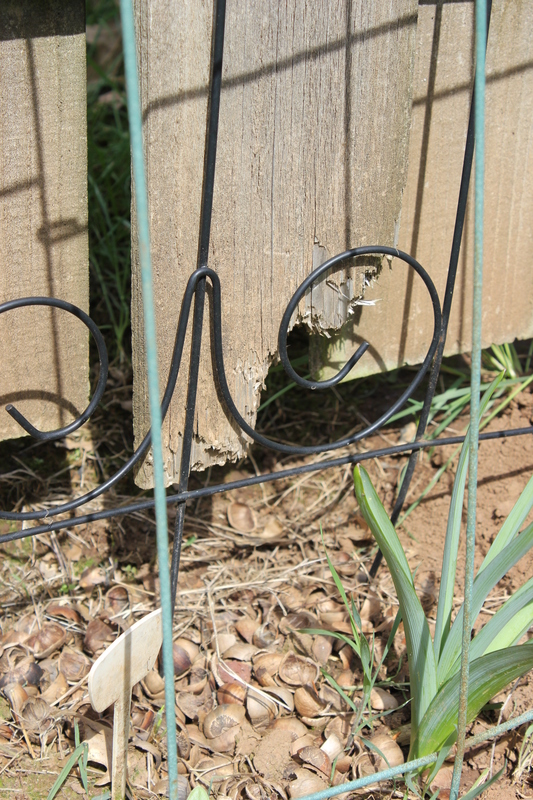 You probably noticed I have a lot of garden fencing up against the wood fence. 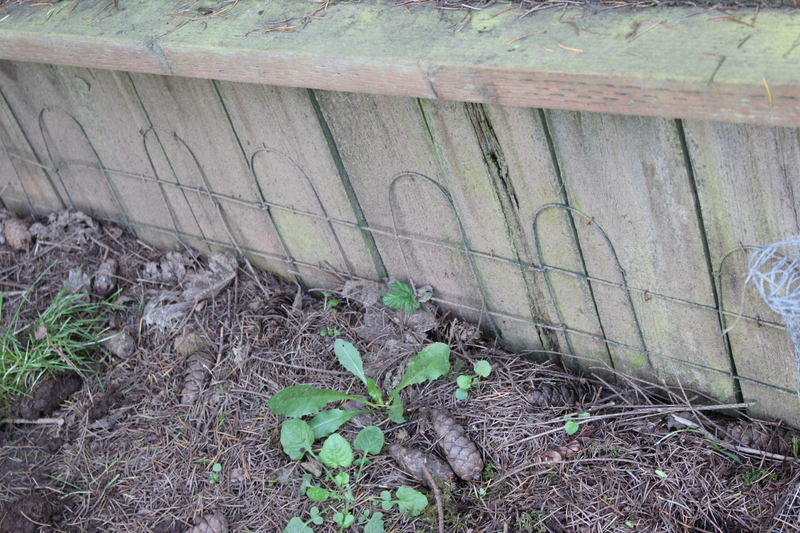 The reason is this: Harvey eats wood fences. What he can’t eat, he digs under. 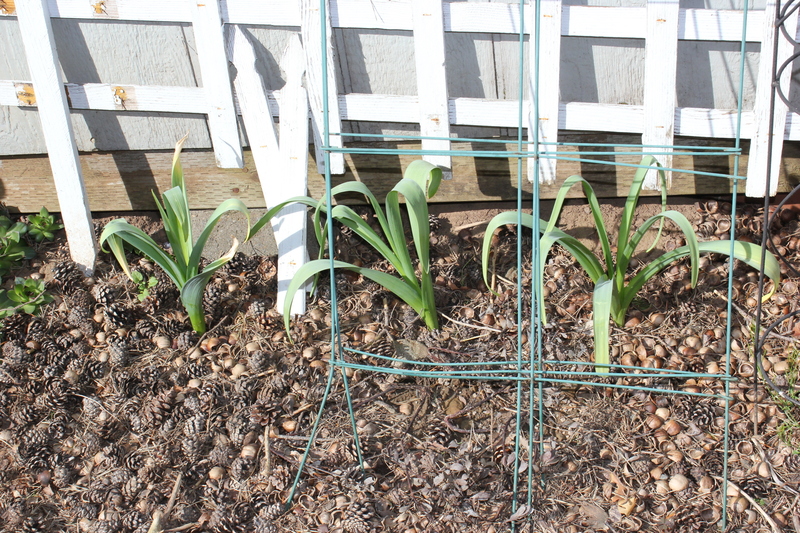 Plus, the fencing protects my gladiolas from being walked on or falling over. 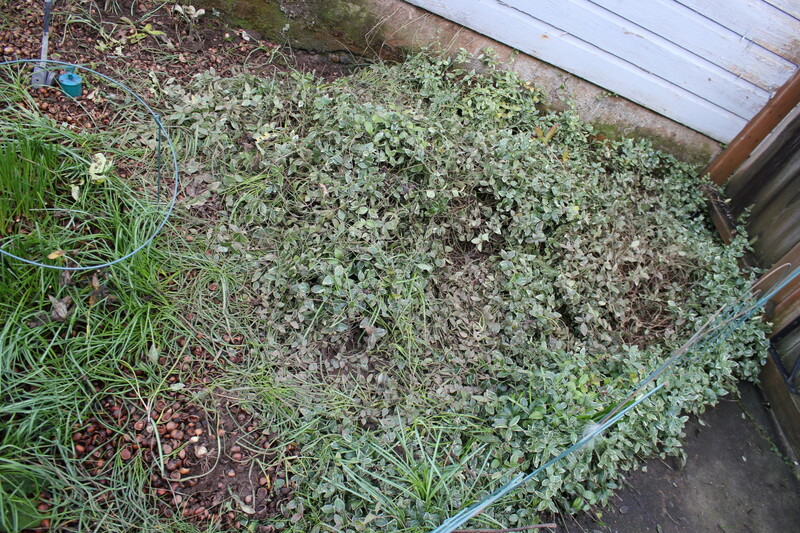 I mentioned digging up grass the old-fashioned way and lamenting how I can’t get rid of it. 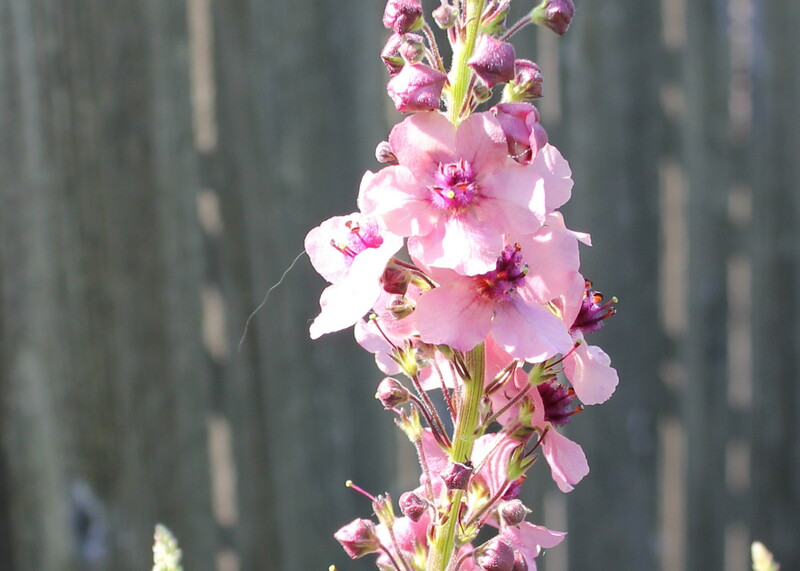 I don’t want to use harsh chemicals in my yard, around the insects or the dogs. I do use an organic herbicide (dawn soap + vinegar) in certain areas. If I have a few dry days, this is one of those areas. It works great for something like this, but the compound does *not* kill the roots and it’s darn hard to apply around precious plants. I’ll treat this area twice in the summer and it will kill all the grass under the wire, but I’ll have to repeat next year. 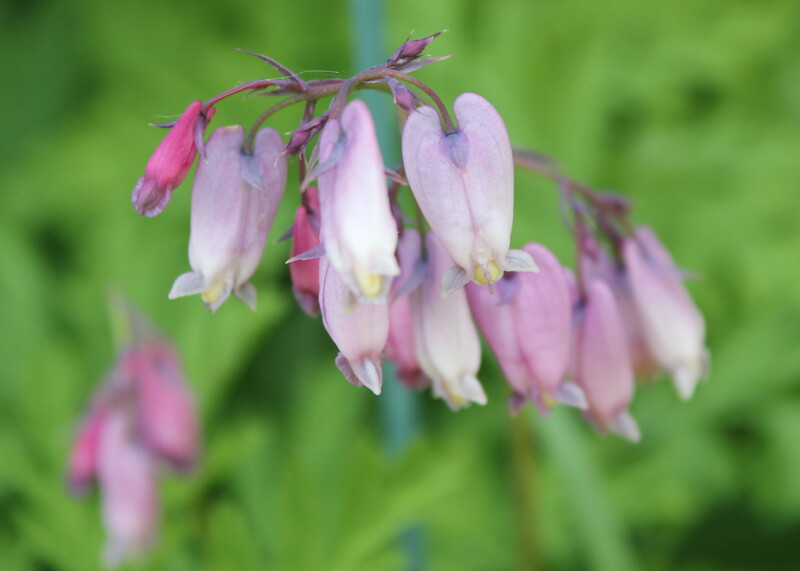 Speaking of under the deck… Native bleeding hearts have taken hold on one end. They haven’t started blooming yet. I love bleeding hearts. 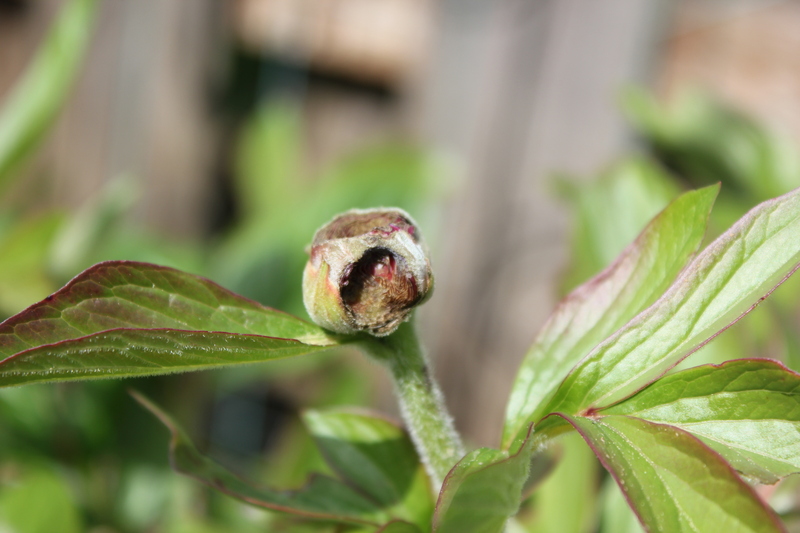 I have one peony that gets bud eaten before it can bloom. Every year. 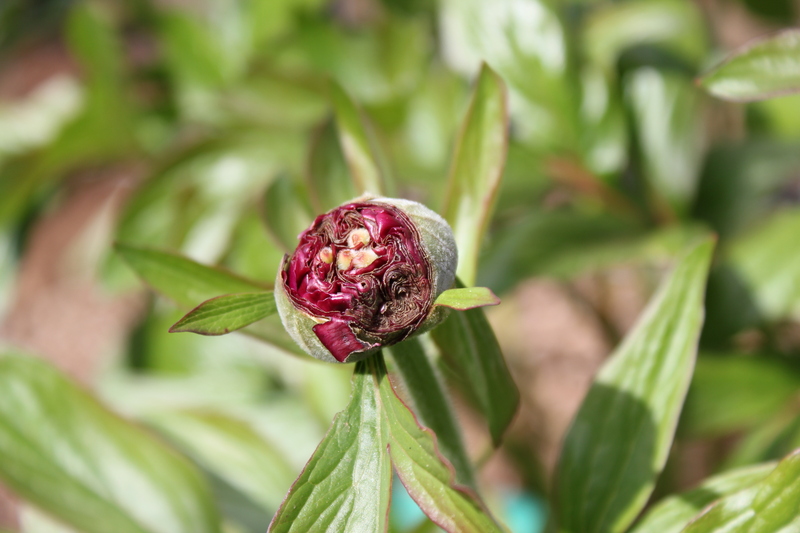 I don’t know why this one peony has this problem: too much shade? 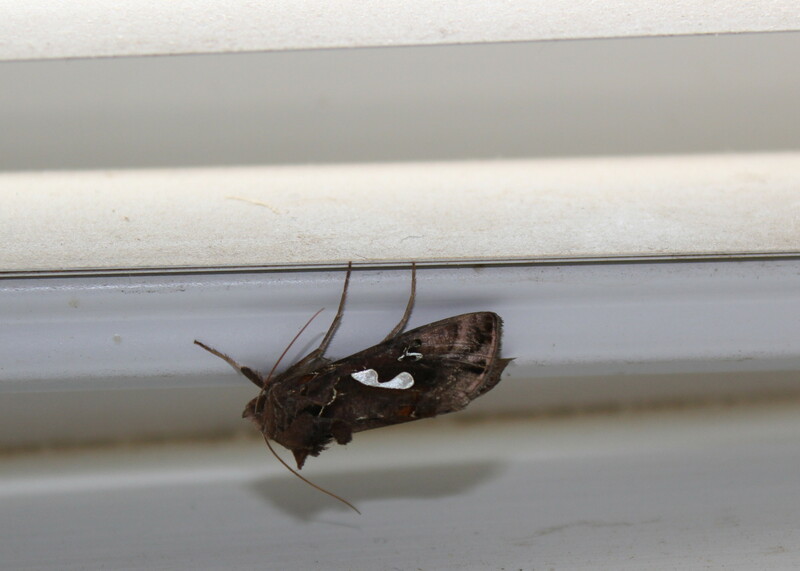 I am thinking of dividing it this coming fall to see if I can get ahead of the pest. It’s a triple-burgundy. 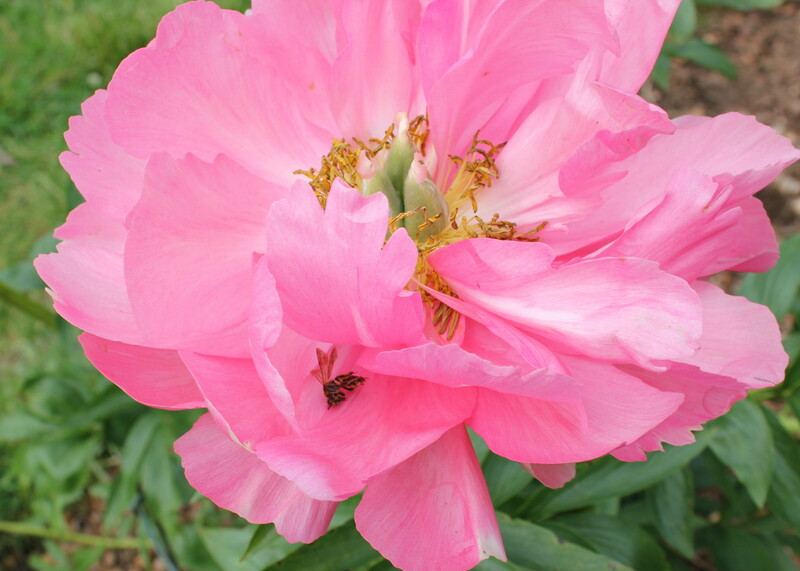 The one healthy blossom on it is crawling with ants – ants have a symbiotic relationship with peonies, so you don’t want to kill off all the ants in the yard. 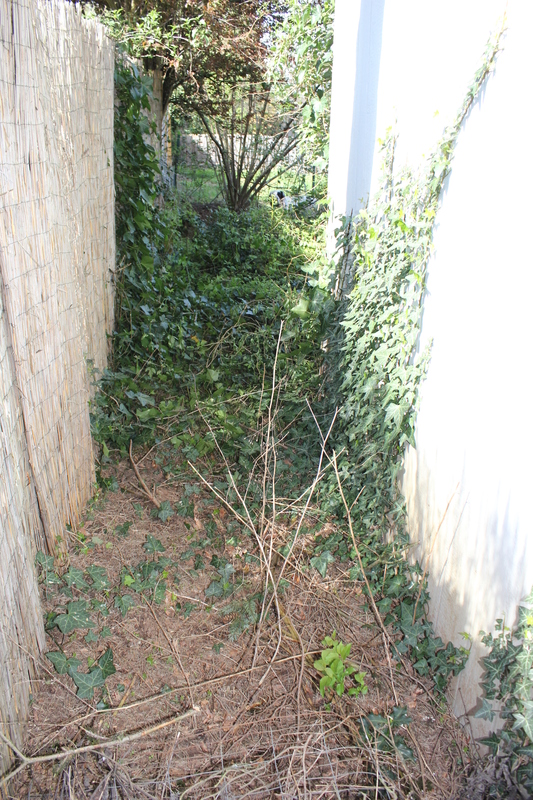 Yesterday, I blogged about problem areas in the yard… This is behind the garden shed. It’s full shade. Ivy, Himalayan blackberries, and nightshade love this corner. I love nightshade. It’s pretty. But it is invasive as heck. Ivy and the Himalayan blackberries… KILL THEM. 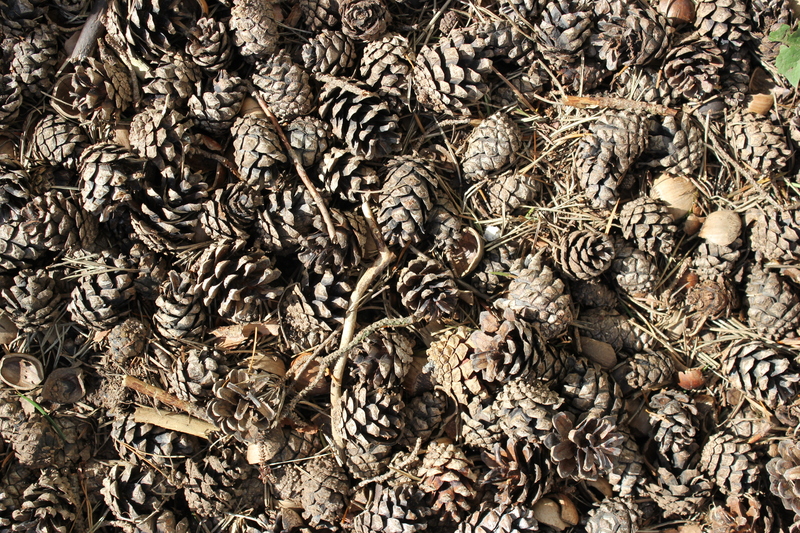 This is what I am up against in my SW garden: pine cones. Acid. 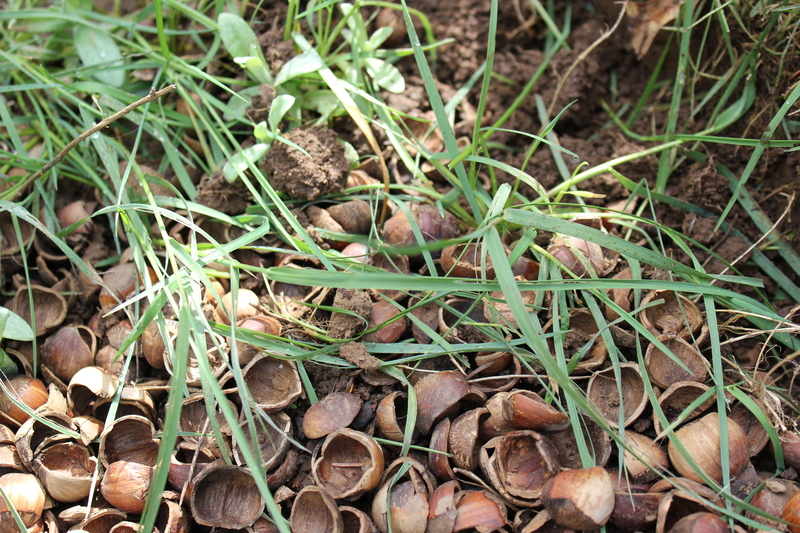 Tiny pine cones. 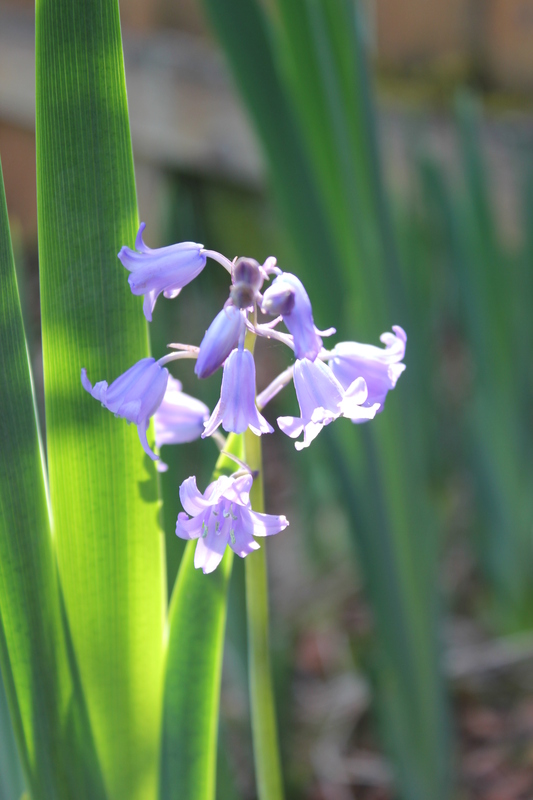 I planted a bunch of bulbs last fall, but I don’t remember what I planted. Can we say “surprise”??? I took a nap and then came back outside. 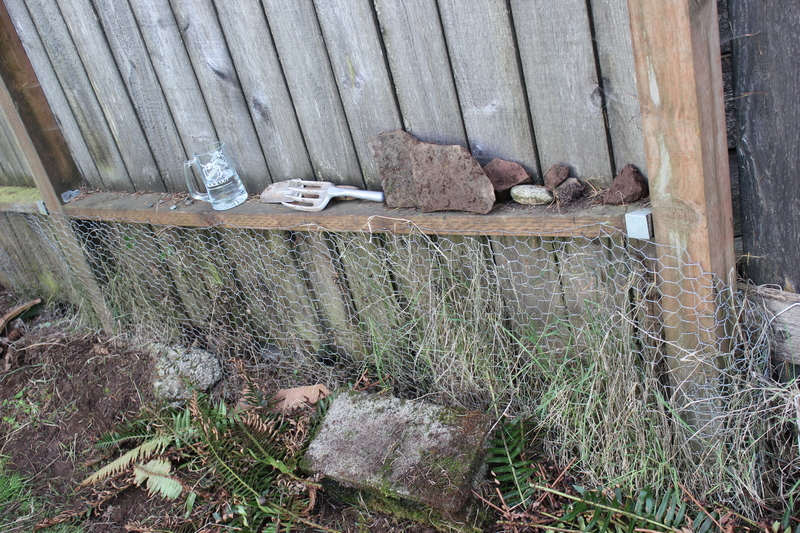 I started on the south fence. 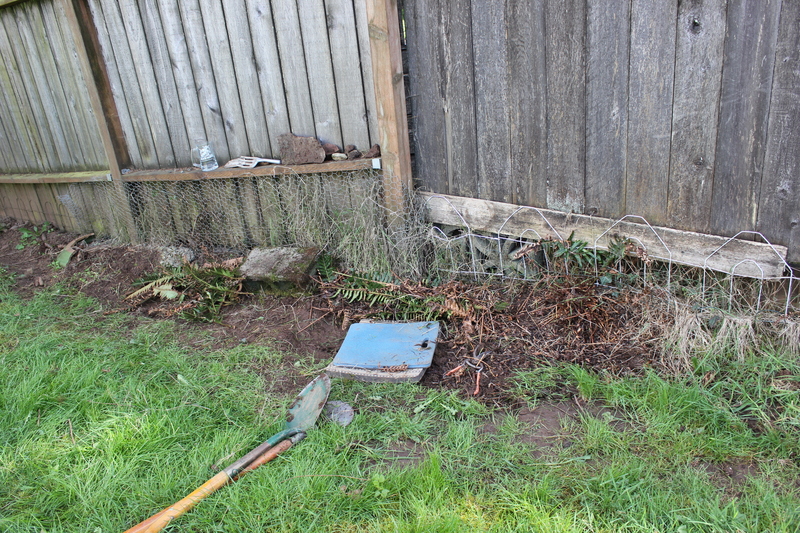 The plan is to hack back the grass and blackberries to create a full shade border. Oh- did I mention blackberries? Not Himalayan ones: these are freaking NATIVE ones that creep along the ground. 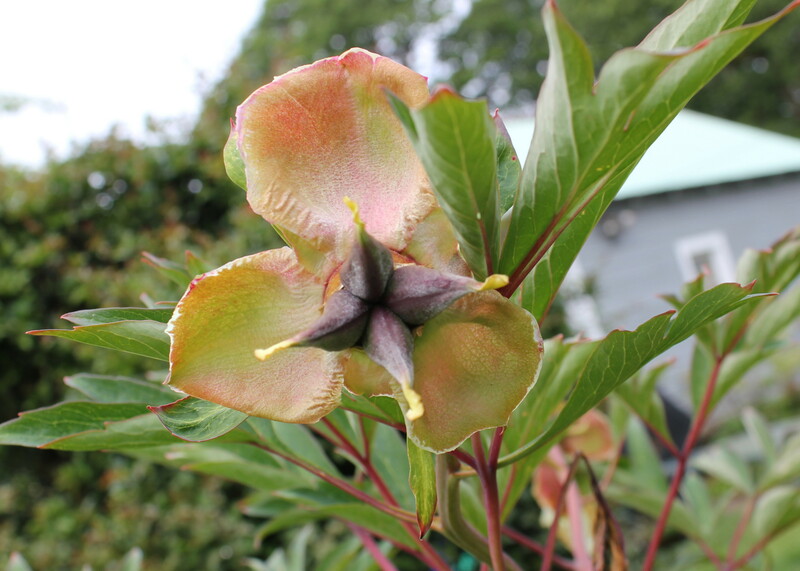 We inherited the Himalayan ones because some emigrant long ago decided that the NATIVE plants weren’t invasive enough or tasty enough. Or thorny enough. I don’t think you can really see what I did there, but I dug up a lot of grass, blackberries, and pruned old fronds off of a native fern. 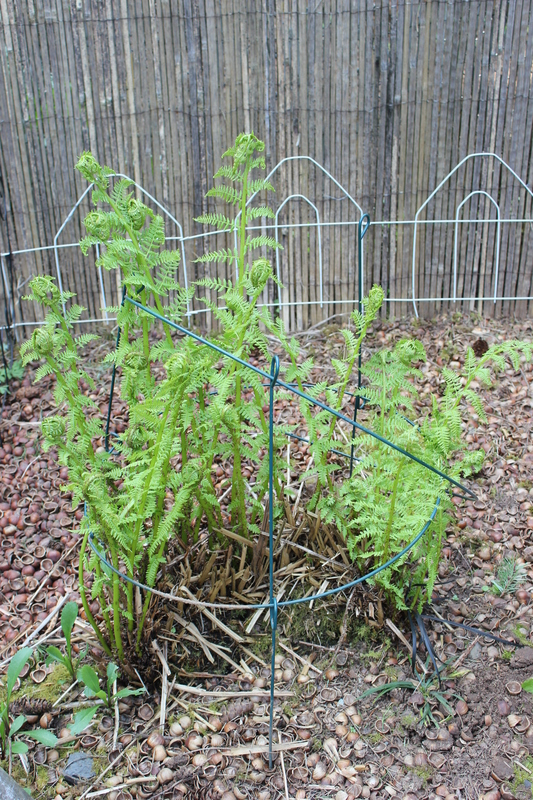 I left the fronds on the ground in the hopes of encouraging new ferns to fill in the spaces. I can’t think of better shade plants than ferns. 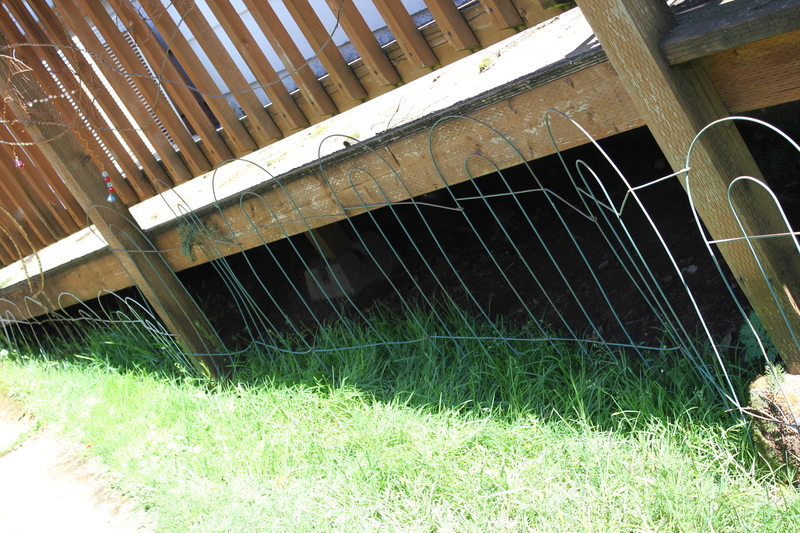 The first year that Harvey lived with us, I put up chicken wire to keep him from digging. I only put it up in small sections and I hope to remove this section this year for the more aesthetically pleasing fencing. He’s never tried to argue with this. I really want to go outside and put seeds and seedlings into the ground, but the fact remains that it is *only* the end of March and no matter how nice the weather is, the last official frost date is around April 15th here, and it is guaranteed to rain cats, dogs, frogs, fish, and buckets between now and the end of Rose Festival. 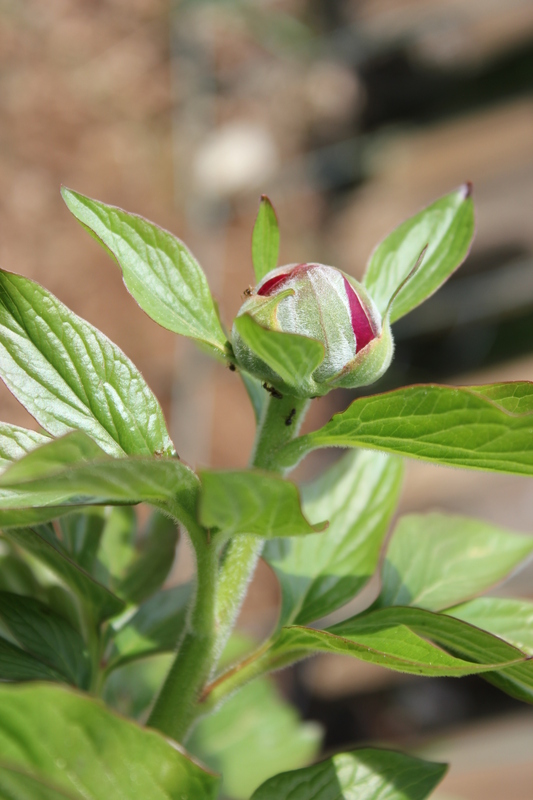 It does not help my itchy green thumb that my peonies are sporting large buds on the verge of opening. 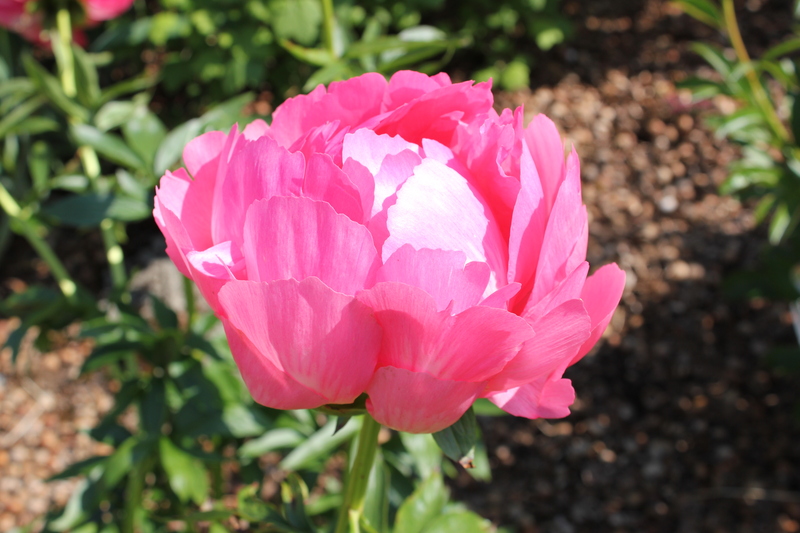 I haven’t been able to cut peonies for May Day since because they haven’t bloomed before the first of May since. I will probably plant pansies this coming weekend, and despite all my knowledge of last frost dates, I will probably plant sunflower seeds, too. 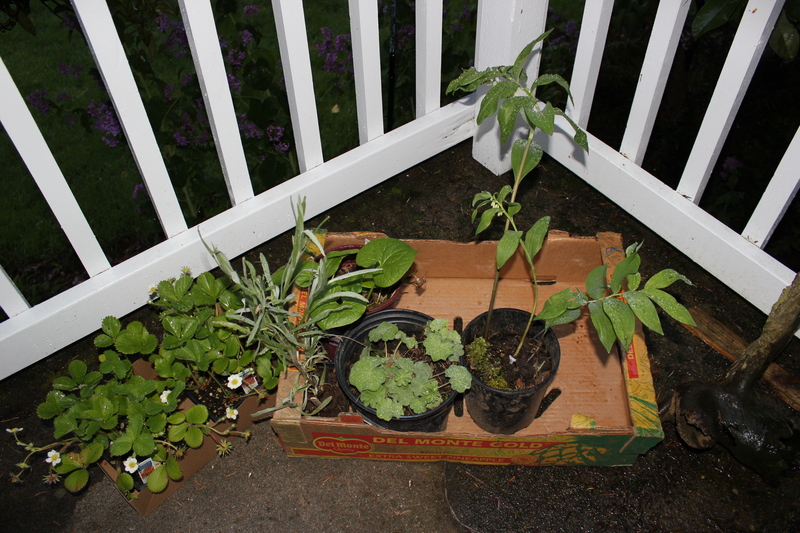 If the sun stays out over the weekend, I will make a futile attempt to get ahead of the weeds (if my left arm holds out – I’m currently nursing a painful case of “tennis elbow”). I have been unable to keep the hummingbird feeders filled. I counted four different birds at one of the unpopular feeders out back. I have no idea how many birds are draining the two out front, but I am replacing one of those every four to five days right now. Drained dry. Summer is coming and I have opted to stay home this summer. I have a big family reunion in Colorado in June (one that was supposed to happen last summer but didn’t, due to a wedding). My reasons are complicated, but first – and foremost, I changed jobs and I won’t have enough time off to go this year. I’ll really miss seeing my elderly Aunts and that weighs heavy on my heart. This is where being a long-distance grandmother is not fun and I understand what my mom must have gone through when I moved so far away. There is something to be said about living a lot closer to one’s relatives. I guess we make choices and mine was to live as far away and as independently as I could, so I shouldn’t be too surprised that my own children made the same choices. It’s in the blood. I am loving my job. More specifically, I am loving the parttime. Yes, I love the new job, and I work with great people – no doubt about that. The part I was worried about when I accepted the position – that is is less than 40 hours a week – is turning out to be a huge bonus. I don’t come home stressed out. I have time to do things. I feel stress falling off of me like layers of dead skin. I’m three months into it and still finding it quite novel to have so much time left after work. I have a life! I haven’t had a “life” for so long that I don’t know quite what to do with it. I’m even making social plans again, something I hid from before. I actually answer the phone when friends call. I go to lunch and dinner. I have been writing more on my art blog about my life than on this blog. 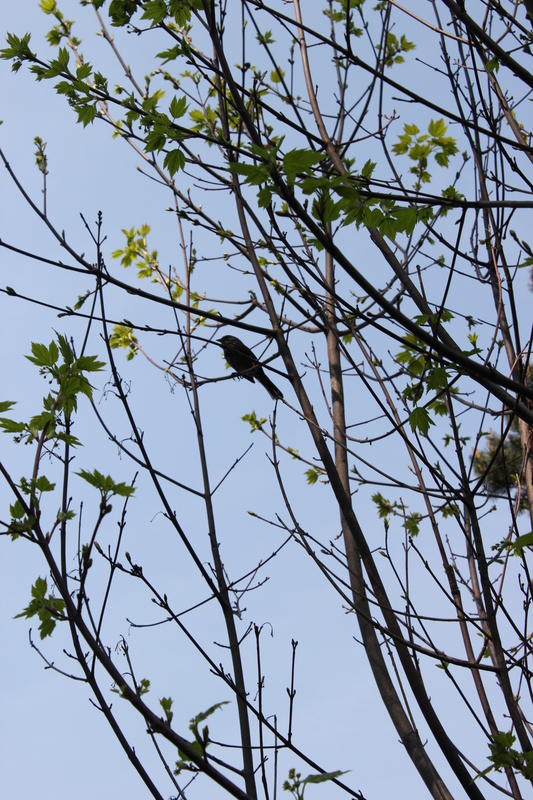 I’m still bird watching, but I have not been taking photos. I need to grab the camera and go for a birding walk soon. Or just a photography walk. Harvey is getting to be a great companion on walks & is pretty patient when I want to stop and take photos. I recently painted five of them. 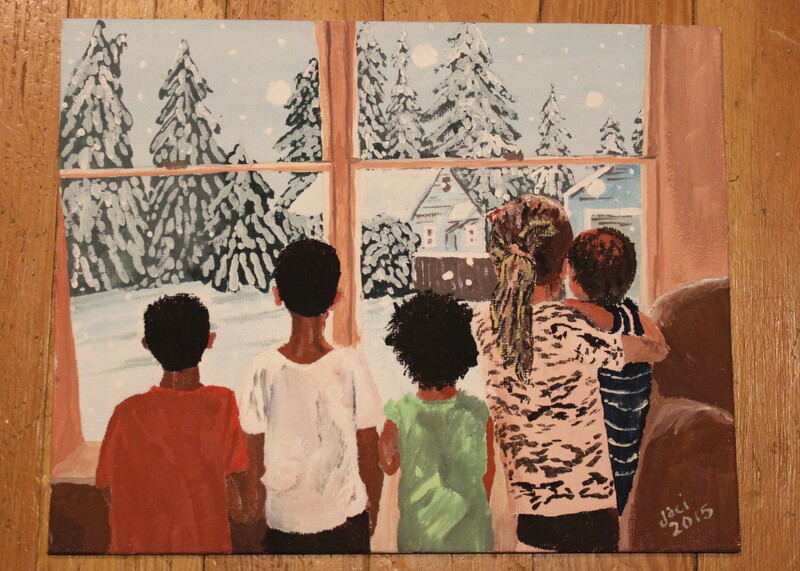 They were posed in a photo, looking out at the snow falling on the ground along the eastern U.S. I took that photo and juxtaposed a photo of our house during the snowstorm of 2009. My five grandbabies looking out the window at my house on the opposite coast of the continental USA. Spring makes me happy, too. This is killing me. 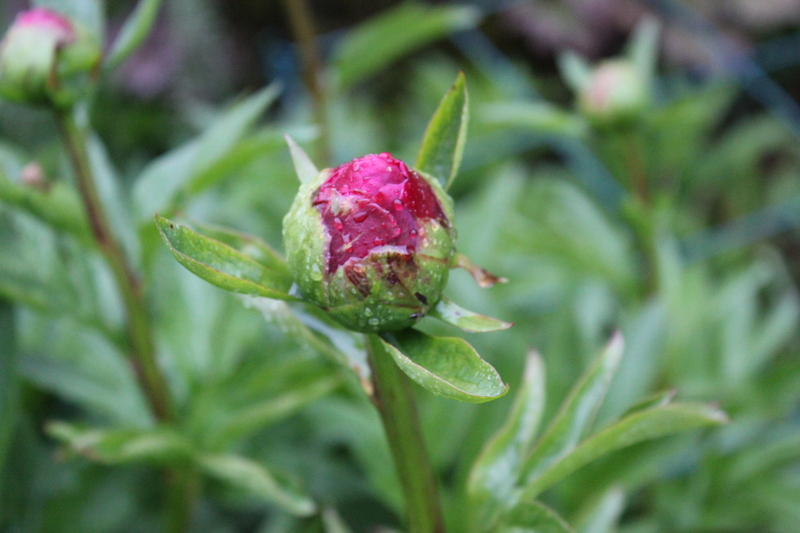 We had a wonderful warm spell when all the peonies grew rapidly and buds began to form, and then (as usual) – cold spell and days of rain. 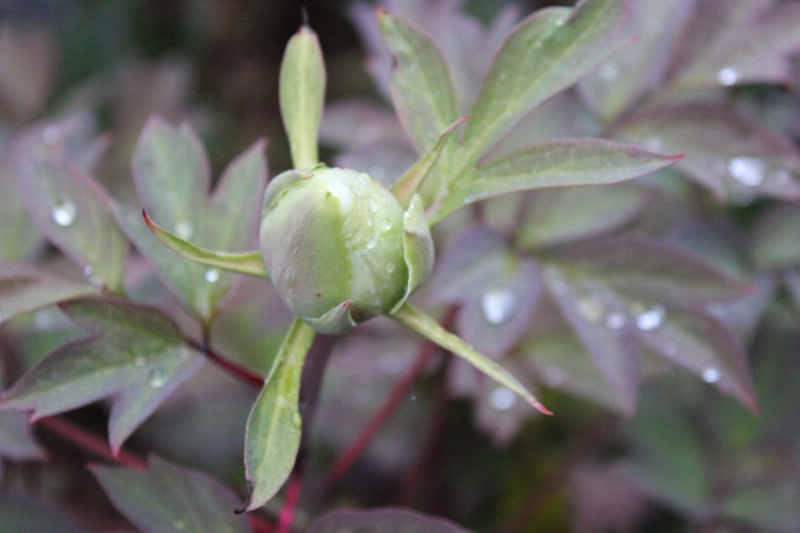 The peonies hover on the edge of blooming, teasing me. It will be 80 degrees (F) on Wednesday next week, and they will suddenly open up in profusion, the whole lot of them, and I am afraid I will miss the glory because I will be in the office, working in my little corner cubicle. 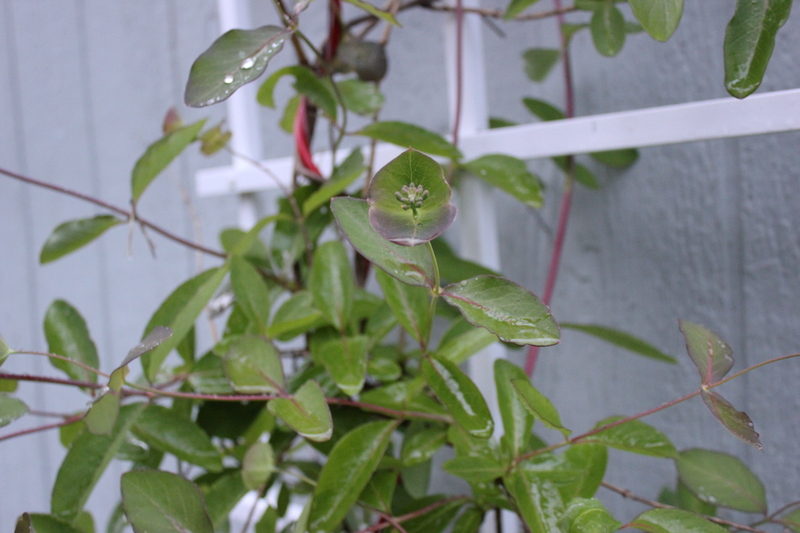 The honeysuckle is really “hovering”. JUST BLOOM ALREADY! 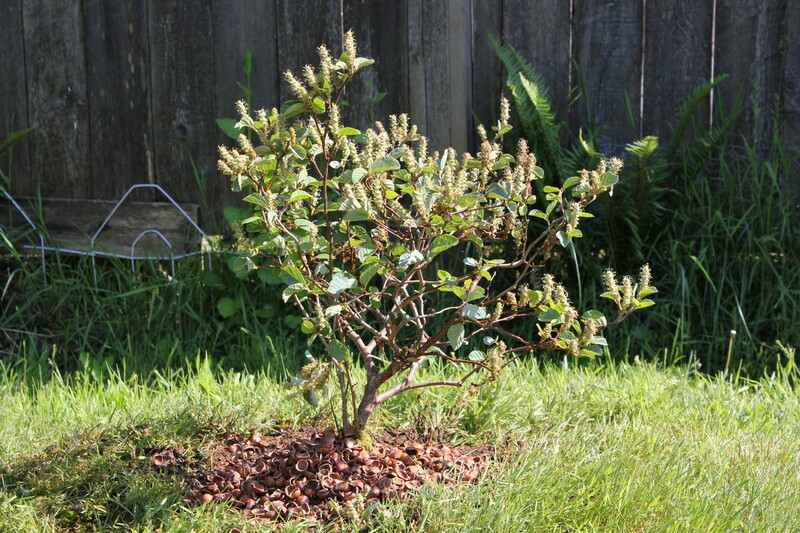 This is my Fothergilla that I purchased two years ago at the the Clackamas County Historical Society Plant Sale. 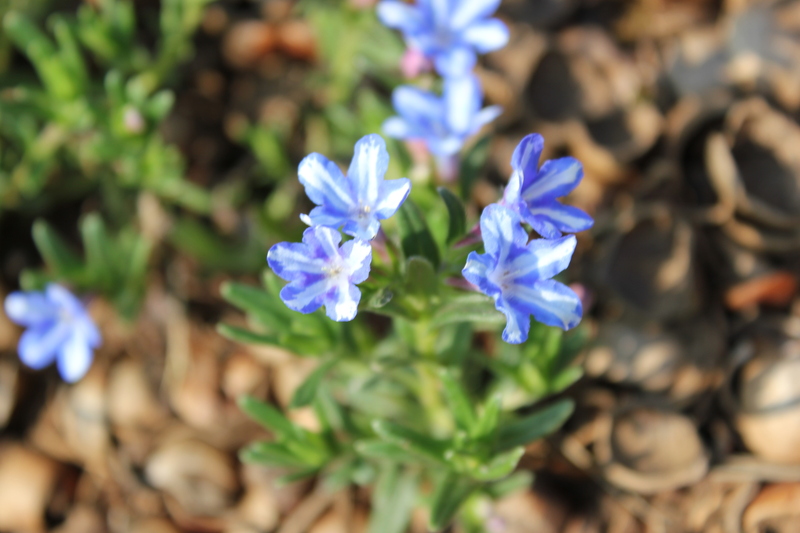 It is gorgeous this spring! 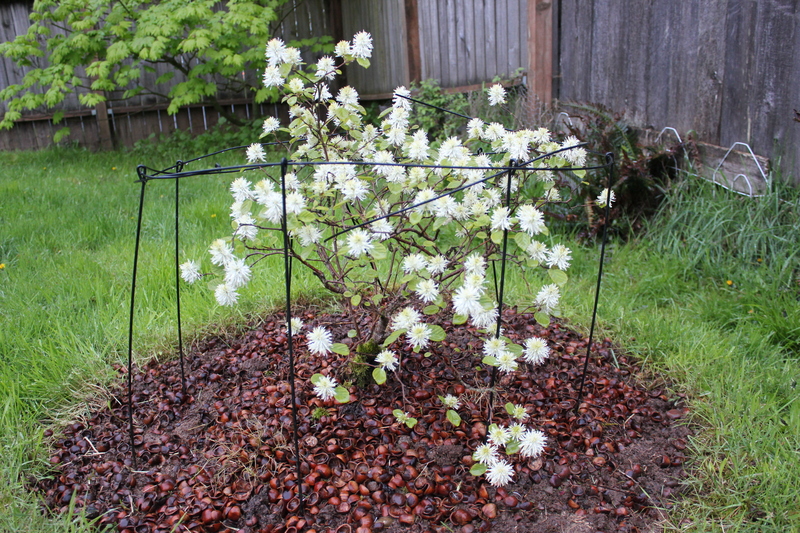 I cannot wait for it to be a full sized bush that I no longer have to protect from male dogs. Last year, I drove by the Plant Sale on some other errand and realized I was not going to be able to peruse the offerings. I didn’t even know it was about to happen and I felt cheated. It’s like an annual yard sale that might have good things and might not. I always spend at least $5 there. It isn’t where the proceeds go (although I love the Historical Society and the museums here in Oregon City, the End of the Oregon Trail), but it’s that most of the offerings have been dug out of someone’s yard and I am so touched that they would share their abundance so cheaply. 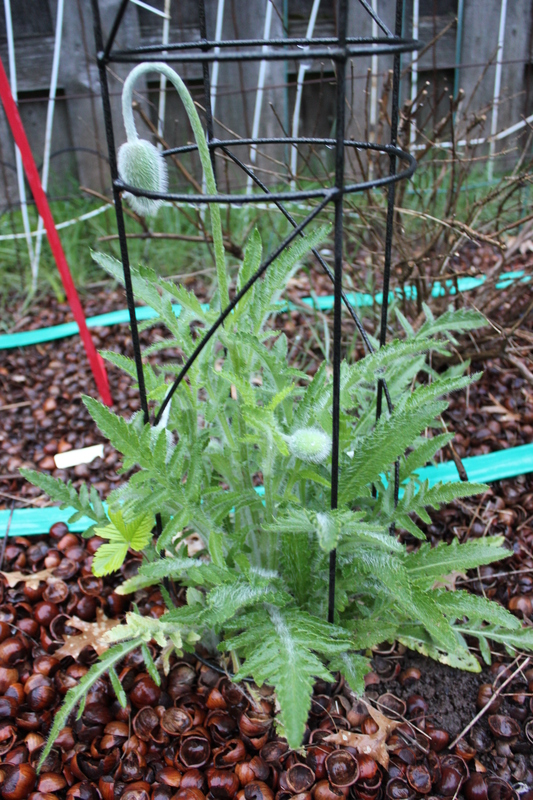 My Oriental Poppy from two years ago is about to bloom. Another Historical Society find. 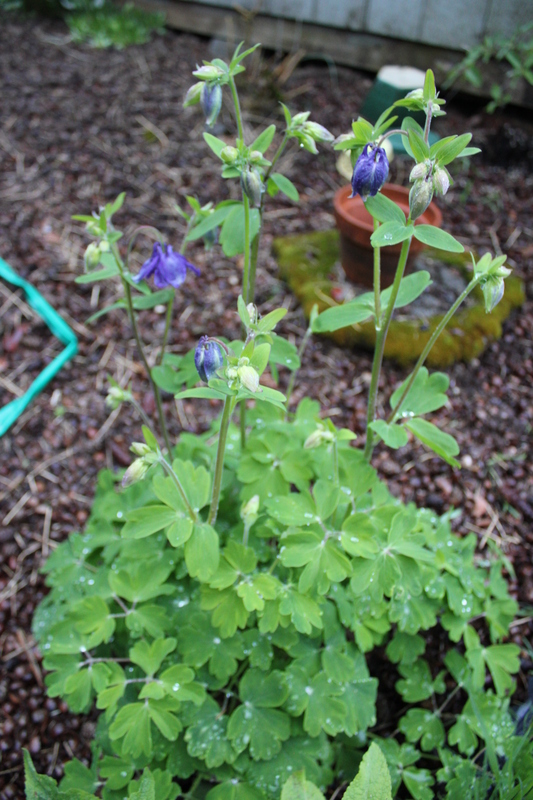 Columbine I bought from the “ladies” of the Society. 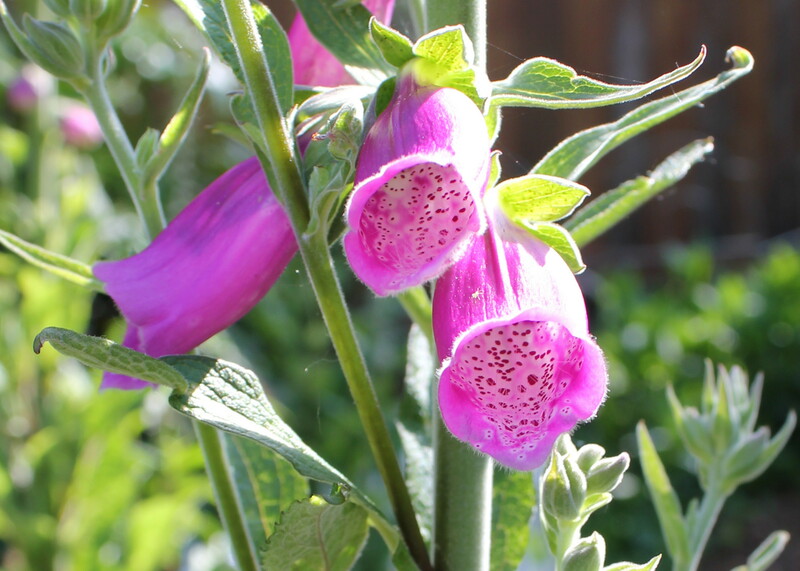 Sure, much of the offerings are things I could dig up and haul down to offer, too: irises, wild strawberries, Shasta Daisy – things you can’t kill even if you have a black thumb. 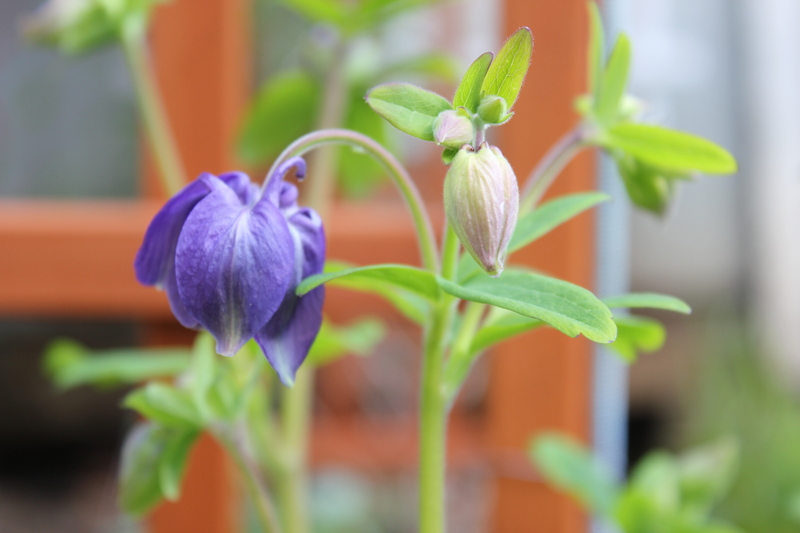 There are the hellebores (I lost count of how many I have purchased from the Society, but one actually lived and is blooming profusely in my garden even now). Roses – I’m not ready for roses, yet. 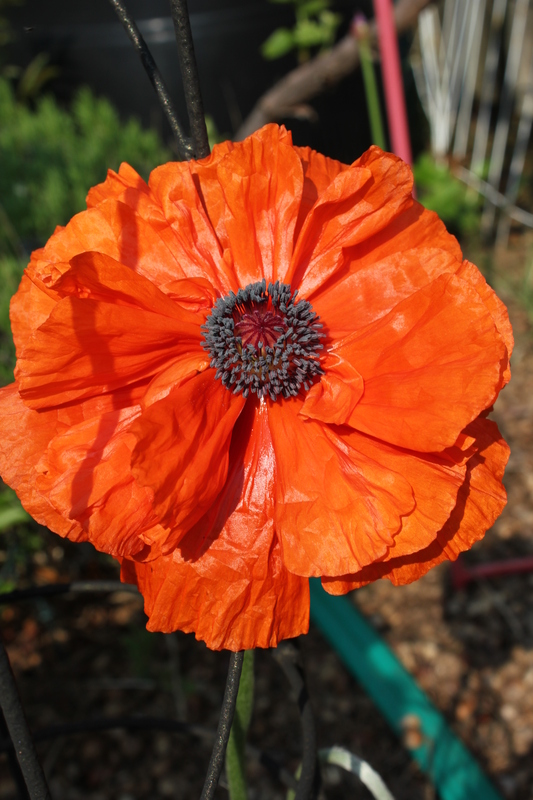 They require a well-tended bed, full sun, free of weeds. I know where I’m going to put them when I am ready for them, but I’m not ready. They had Italian prunes this year. I wanted an Italian prune. I just have to decide where one is going to go. I love Italian prune plums. I’m not a fan of other plums, but these deep purple, almost black, ones are the best. I had to Step.Away. 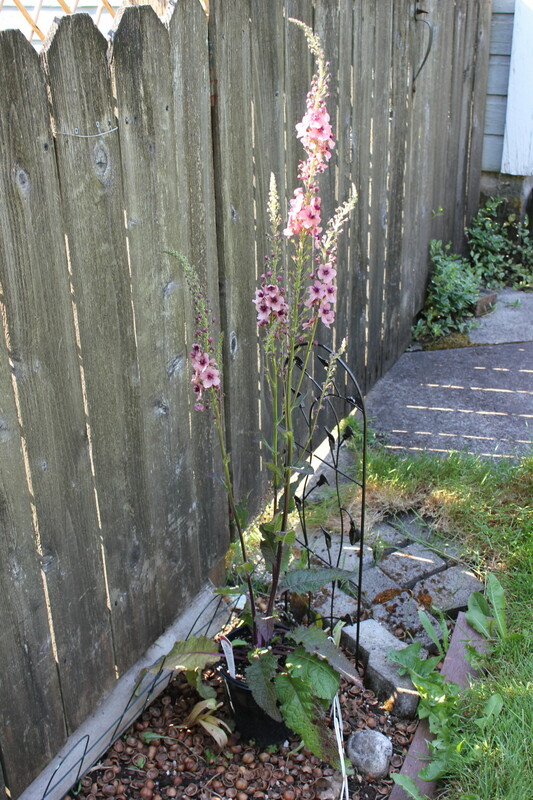 I will plant the wild ginger back in the back corner, in my prayer garden. 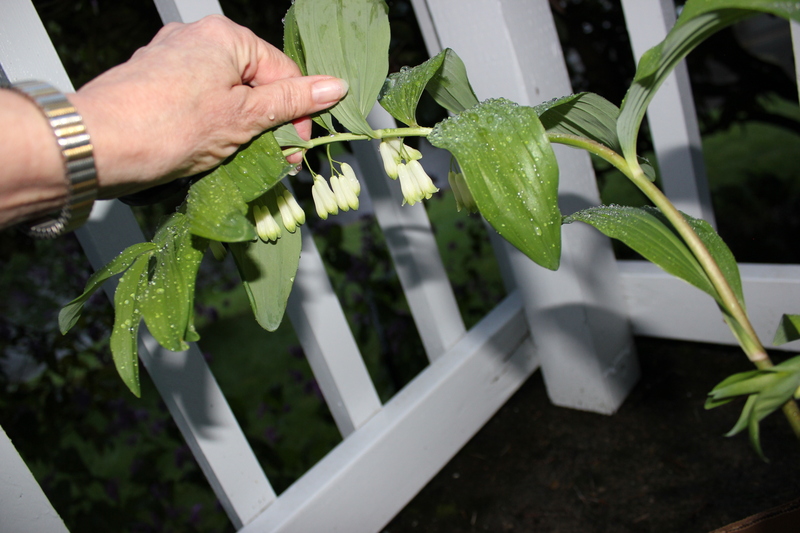 I bought the Solomon’s Seal just because of these flowers. 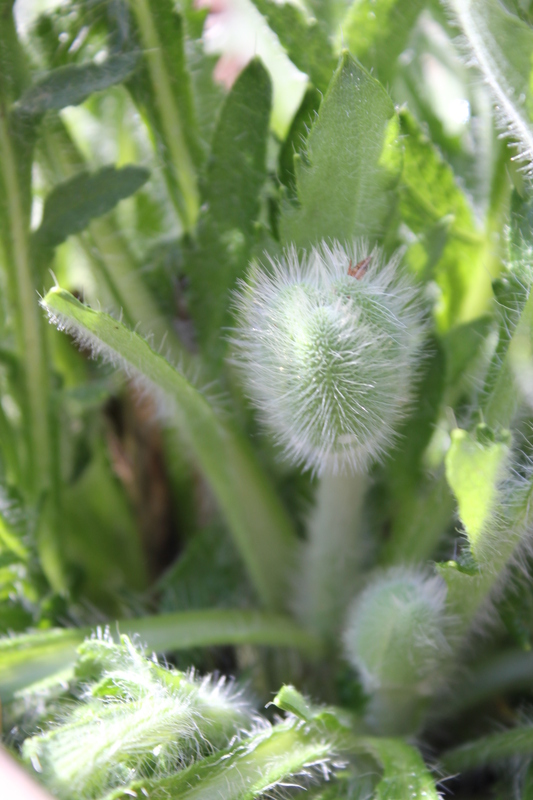 This is a mature plant. Beautiful! 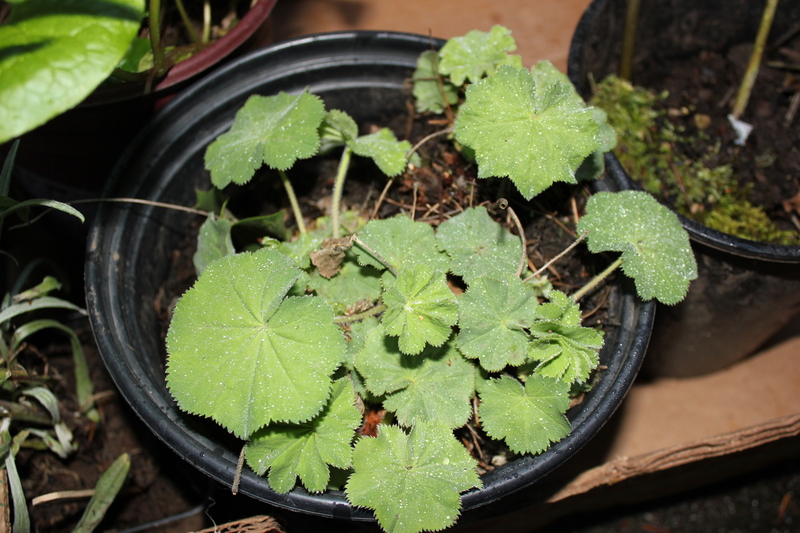 I don’t know why I bought the Lady’s Mantle. I had to google it. I love the leaves. I know I will explore this treasure some more after my brief search on the Interwebs. I do have flowers in bloom. Chrystal threw a bunch of seeds off the deck many years ago and I still get the plants every spring. I call them “Honesty” plants, but others call them “Money Plants” or “Dollar Plants”. They make great cut flowers. 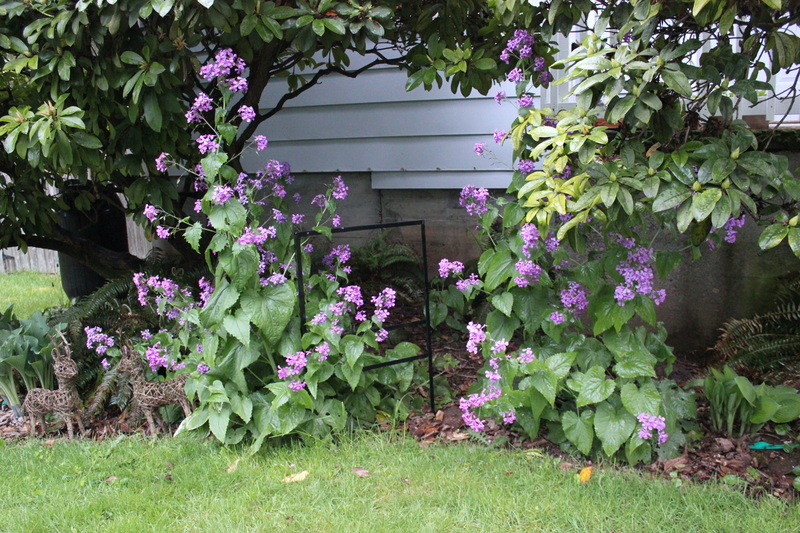 Both lilacs are in full bloom. This leads to a digression. I have a coworker who grew up in the Ukraine. She’s probably 20 years younger than I am but we share a lot of common “folk” knowledge and plant knowledge. 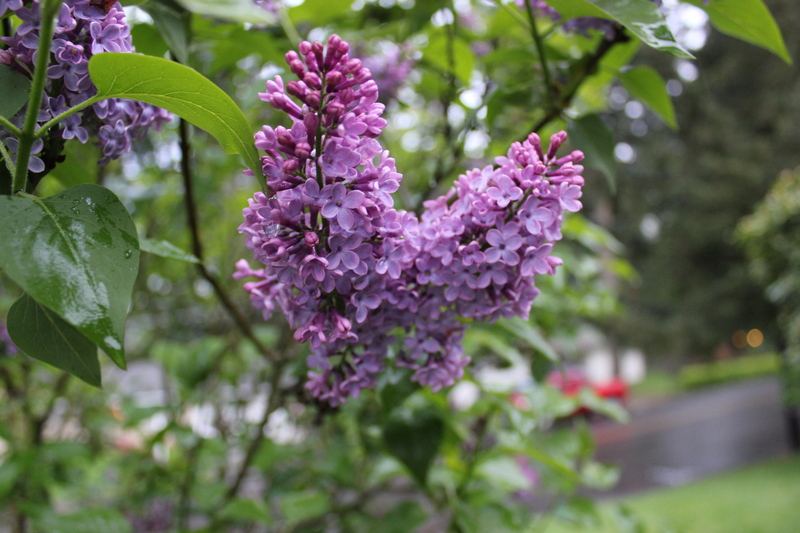 Recently, I took a bouquet of lilacs to work: wonderful, fragrant, lilacs. My coworker commented that they had lilacs in the Ukraine. I asked her if they ate the blossoms? 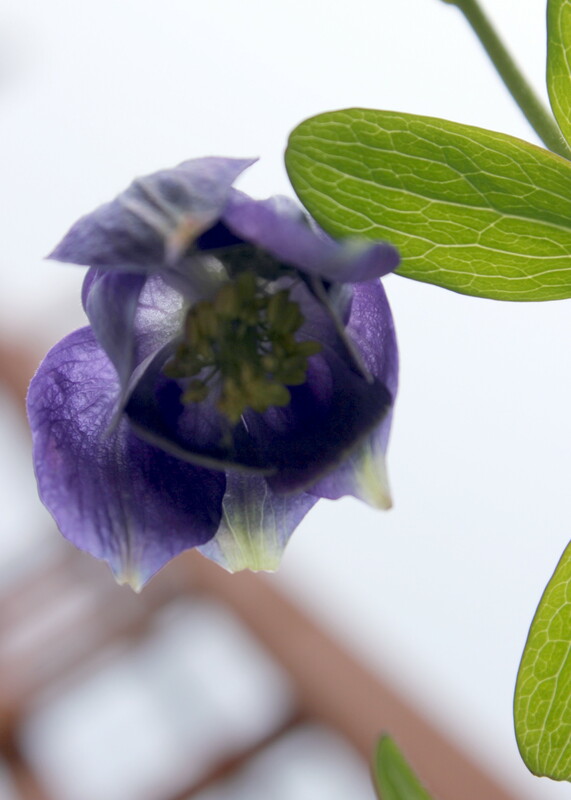 We always picked the little purple florets and ate them – sweet, sweet delight. She told me something that I did not know. 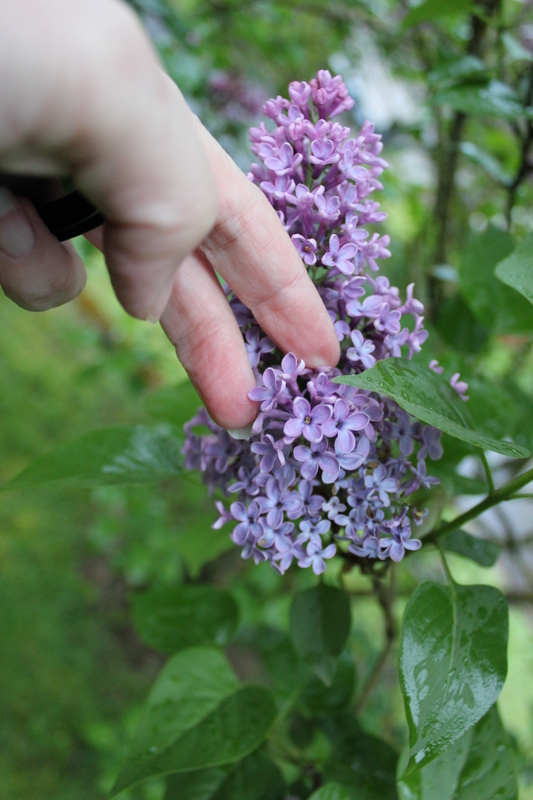 Most lilacs have only four petals on the florets (or eight, on the doubles – I have a double, not pictured). You don’t eat the four-petaled florets. You look for the ones with five petals. Then she showed me. Lo and behold. 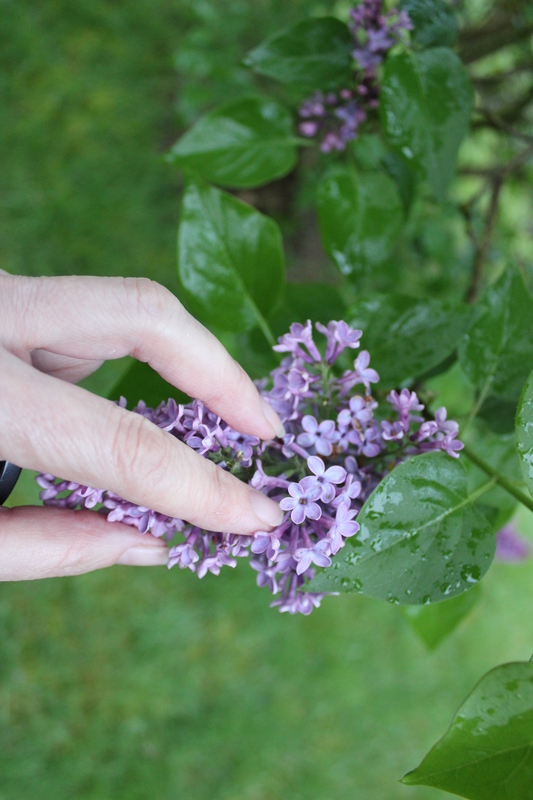 A “lucky” lilac floret. That is the one you eat. Isn’t that a cool bit of trivia? Now, if only these would get with the program! !